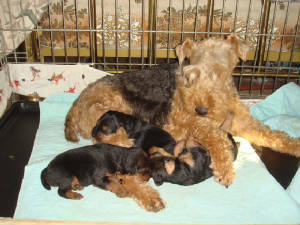 We are still breeding a couple of litters a year, but are no longer updating this site. Please call or email for information and recent pictures. Please scroll down and enjoy our history. 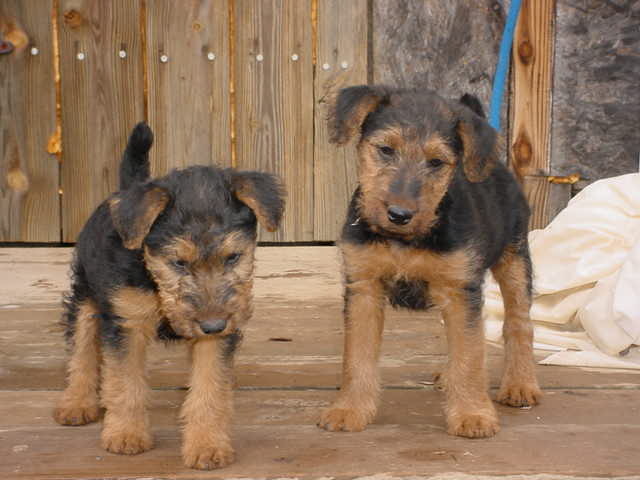 Glad and Detta's litter have all been spoken for. We look forward to watching these pups grow and go tho their new homes. 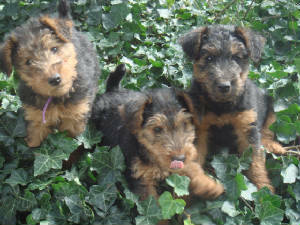 The next breeding is estimated to be in January, bringing pups in March, ready for homes in May. 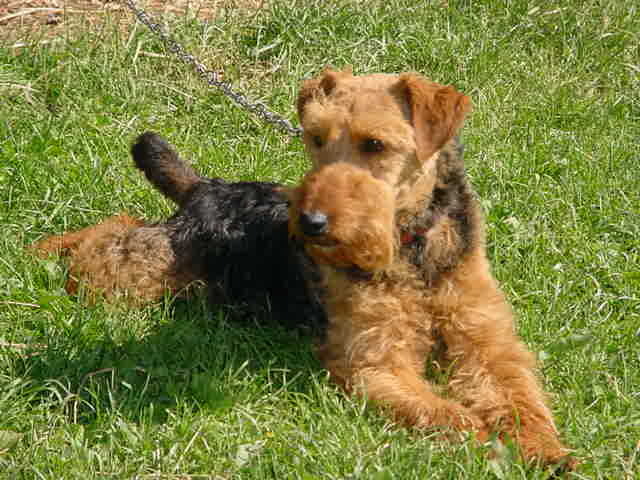 I am happy to speak with anyone interested in the Welsh Terrier. 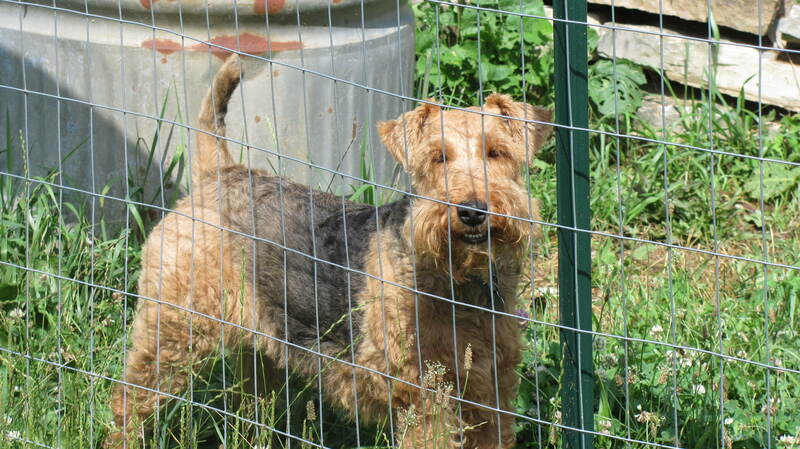 Please scroll down and enjoy the look at the wonderful dogs here at KRK. Two pups are currently under deposit. 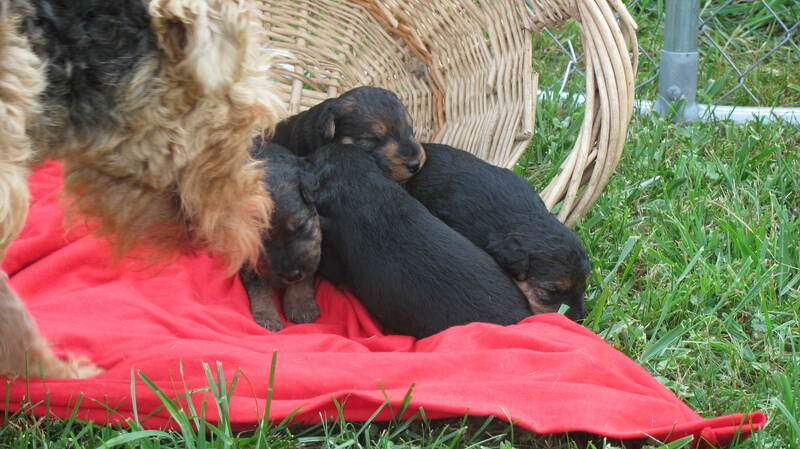 Please phone or email to inquire about the possibility of getting a pup from this litter. Detta grows fat, and is due shortly. She will have an x-ray this week to see how many pups she is carrying. One pup is currently under deposit. 276.677.3851 or email kissingrock at va dot net. 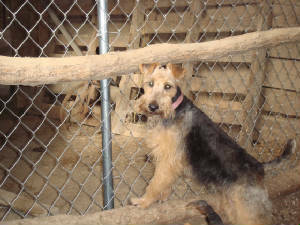 Update: Sadie has been placed in a great home! Be a good girl Sade! While we don't usually have adult dogs, Sadie came to us due to her owner's serious illness and inability to continue to care for her. She is 5 years old, spayed, and utd on shots, worming, etc. 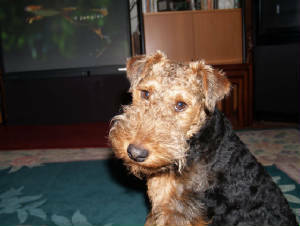 She is a lovely girl, on the large side, very playful and smart in that wiley terrier way... She is lovely in the house. 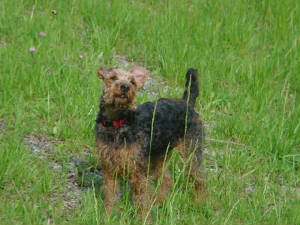 She needs a family with fenced yard that is knowledgable about terrier behavior. 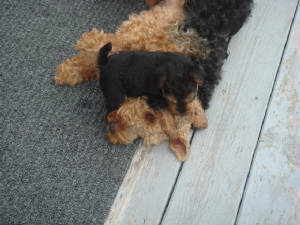 She gets along with other dogs as long as they are properly introduced. 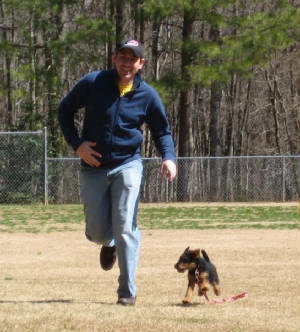 Sadie can be very strong on the leash when encountering other dogs. We've been working on that. Her family will need to continue training on this. 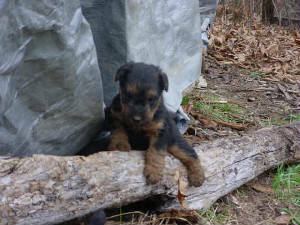 Family needs to live within driving distance of southwest Virginia, as I will not ship her. 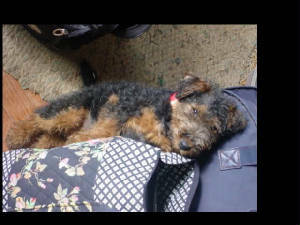 We welcomed Tesni to our pack last month. Tensi, from the Welsh, meaning "Warmth of the Sun". She is 5 months old, and a loving and active pup. We look forward to raising her along with one of Wynnie and Monkeyman's girls this summer. 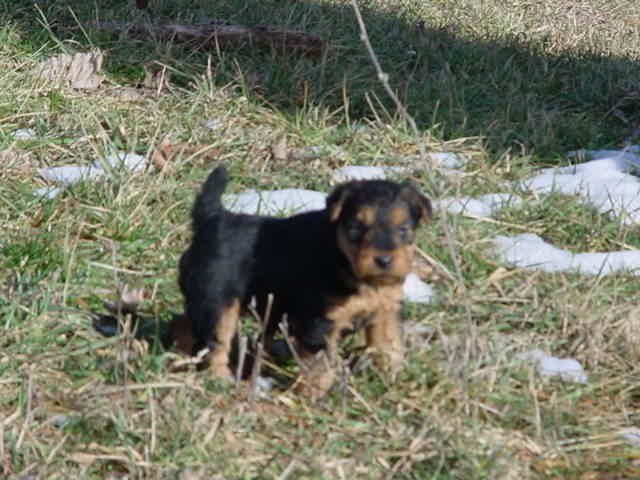 Wynnie has been bred to Monkeyman for a late March litter. 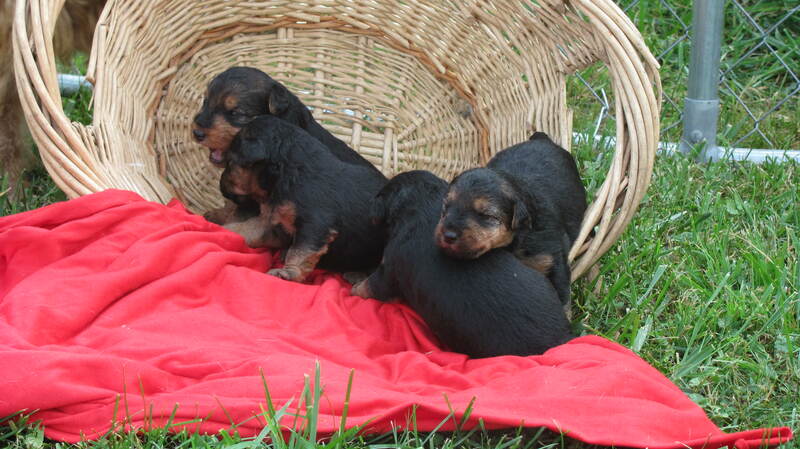 At this time, 5 pups are spoken for. She will have an ultrasound in about 3 weeks to determine how many she is carrying. We are hoping for at least 5! 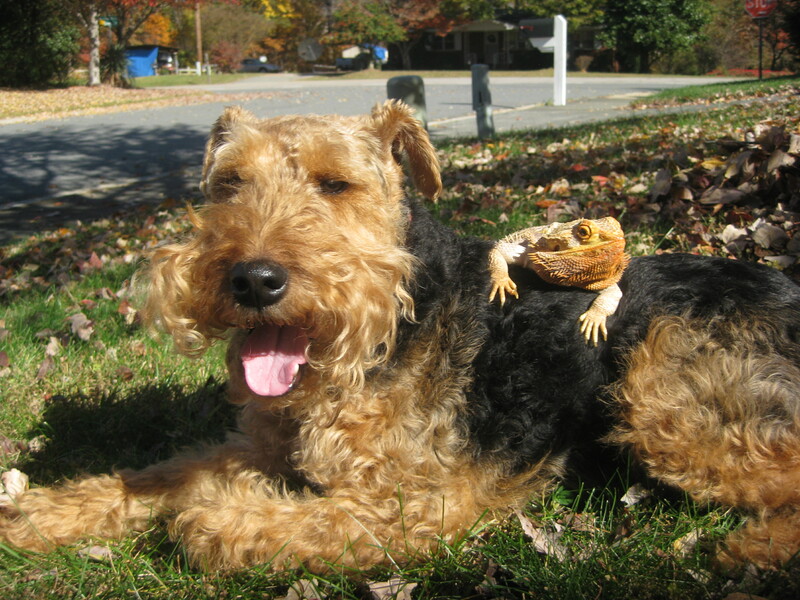 We often get questions about compatibility with other pets. A couple of years ago, I got one that stumped me. 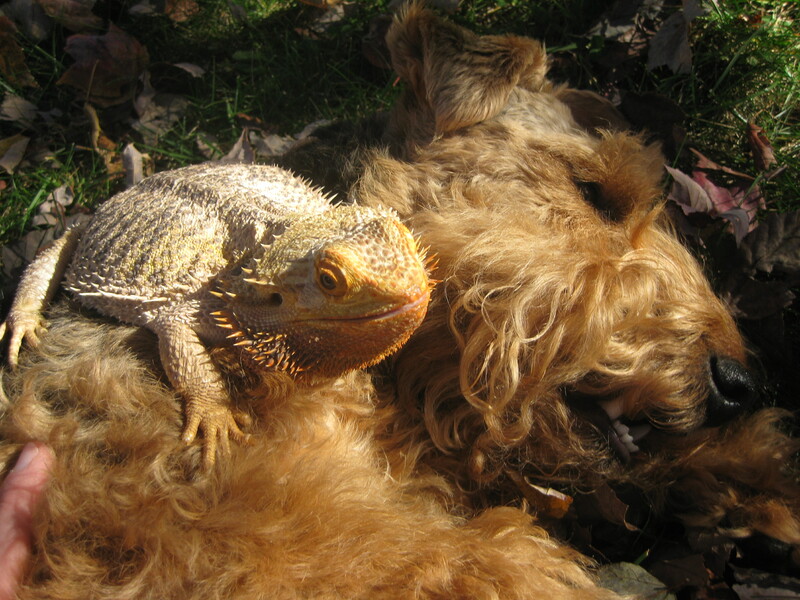 "Will a pup get along with a Bearded Dragon?" My best answer was... Don't know. Hopefully, it's just a matter of proper introduction and training. 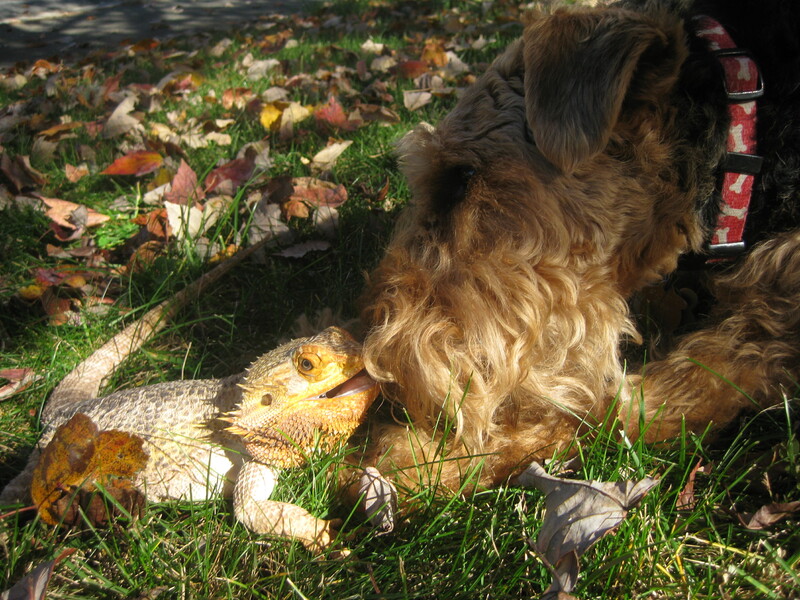 My biggest fear was that the Dragon, Brisbane, would bite Denbigh's nose off. I should have saved it. Den's folks did a stellar job of fostering inter-species detante. And we've got the pictures to prove it! Good boys! 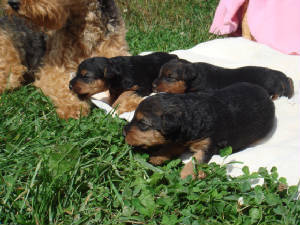 Detta has 3 lovely boys by Gladwyn. 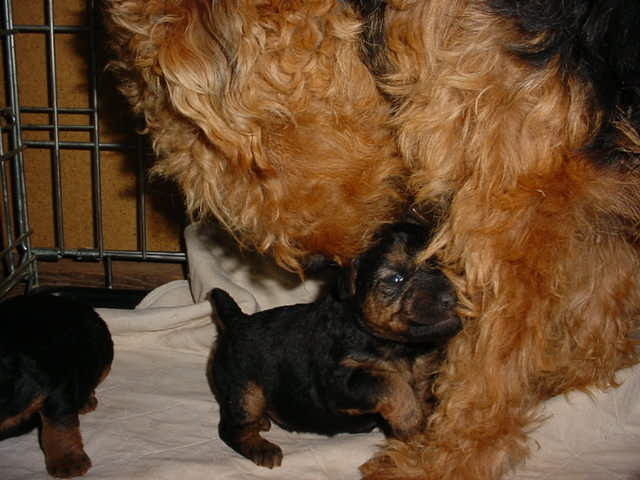 She is a first time mother, and doing just fine. All pups are currently under deposit. 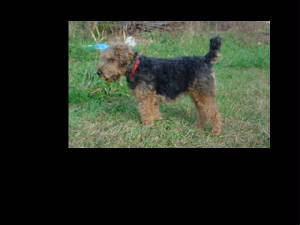 A winter breeding is planned for Wynnie, and hopefully will produce a litter ready for placement in late spring. If you are interested in getting on the list for Spring '13, please give a call or e-mail. 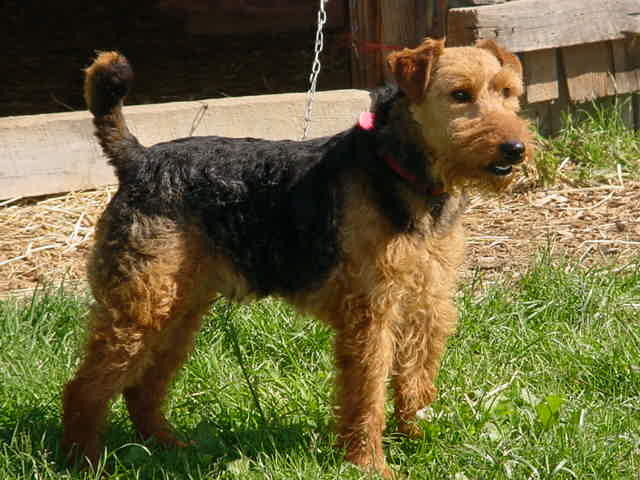 We're always glad to talk Welsh Terriers. 276.677.3851 or kissingrock at va dot net. 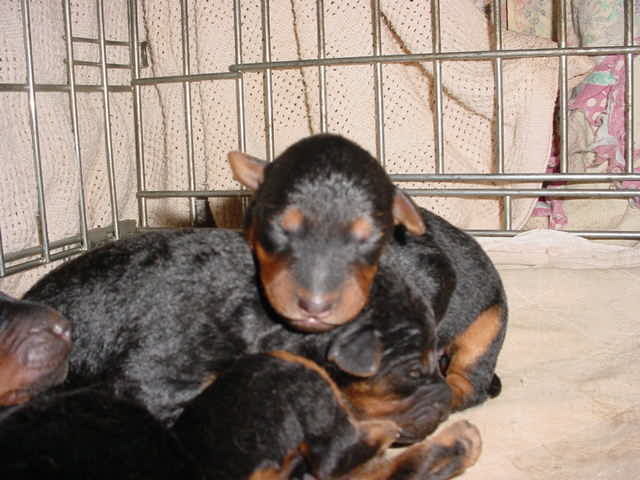 Vala had 3 beauties, 2 female, one male. They're all going to great homes around Thanksgiving. Here they are from birth to today. Growing fast and becoming their funny little individual selves. They grow so fast! Before we know it, they're ready to go out and explore the big shiny world. They ride increasingly bigger baskets to get out. I sound like a crazy pup lady, murmuring "Wee-wee, doots outside" all the way... soon they will be big enough to run all the way from their inside quarters to the yard without stopping to create more work for their peep. Week by week we go further from the known world. We encounter obstacles. At first even tall grass stumps them. Ah, but then we turn from babies into..... Adventure Pups! Fallen limbs, pipes and stumps. Nothing stops inquiring noses. 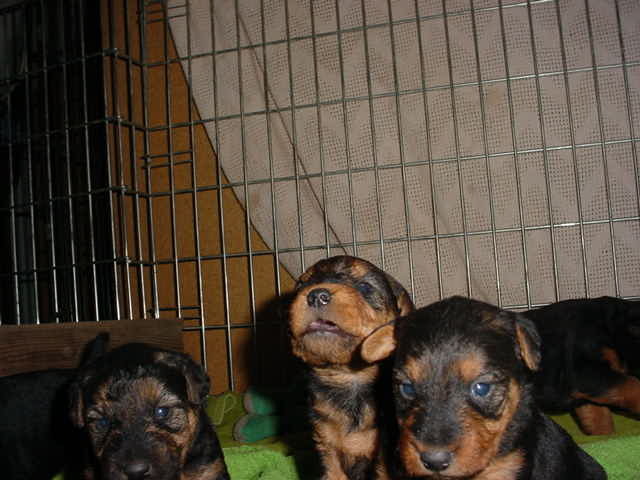 This is a very bold trio of pups. 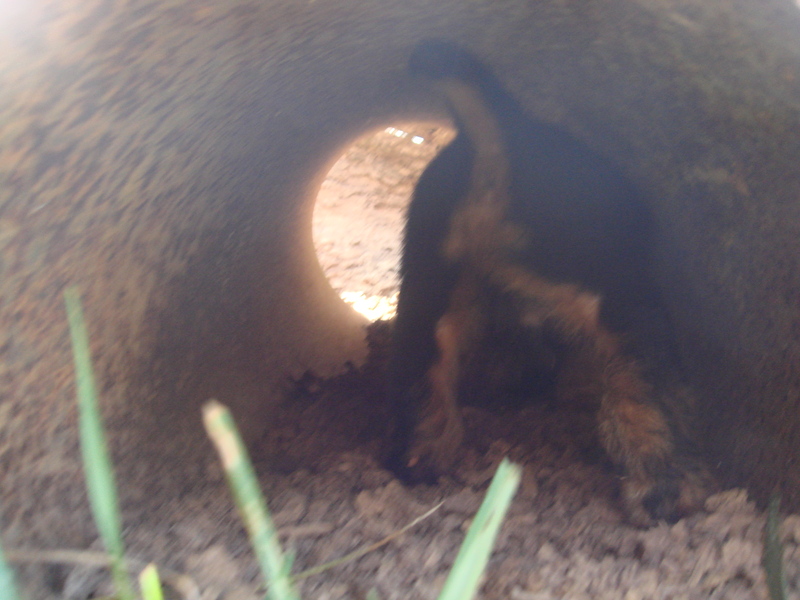 Usually, I will have to encourage them to enter the pipe. These Adventure pups did not need any urging at all. They were in and out, up and down, all over that thing before I could say "Git it!" As usual, upon return from Adventuring, it's nappy time. 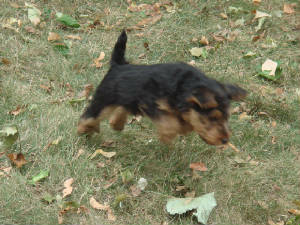 Wynnie's pups flew out the door at 9 weeks, ready for their homes and eager to get started in their new lives. 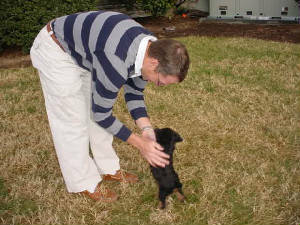 had plenty of walks, as well as the usual vetting, health care, and socialization. Vala is due around Labor Day. We eagerly await the litter. 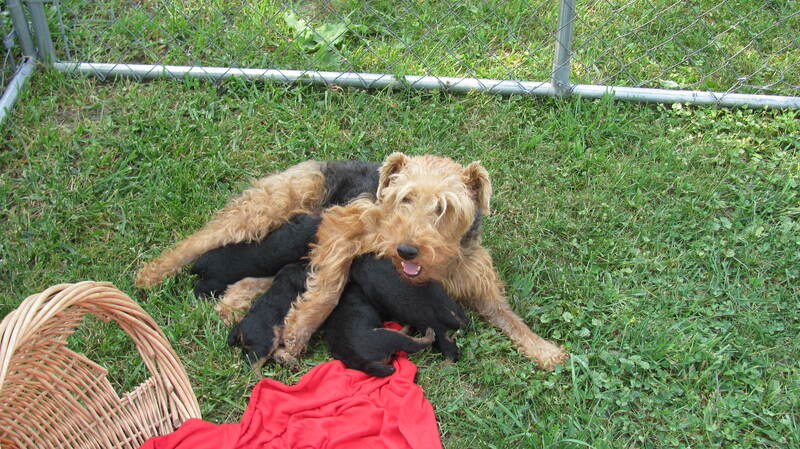 She is carrying 4, and all pups are under deposit at this time. In July, we welcomed Claudette to the pack. She is a lovely and gentle girl. 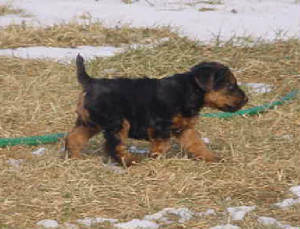 She has been bred to Gladwyn for a mid-October litter. 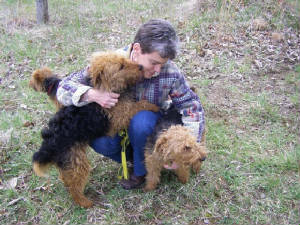 If you'd like to consider one of these pups, please call me at 276.677.3851, or e-mail kissingrock at va dot net. Pups are $975. 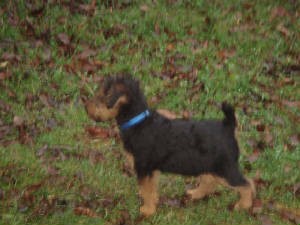 which includes microchip and limited AKC registration. Thanks for visiting the site. Visitors to the kennel are always welcome, by appointment. Please continue to scroll down for a look at the history of the Pack. 3/5/12 Time flies for the busy. 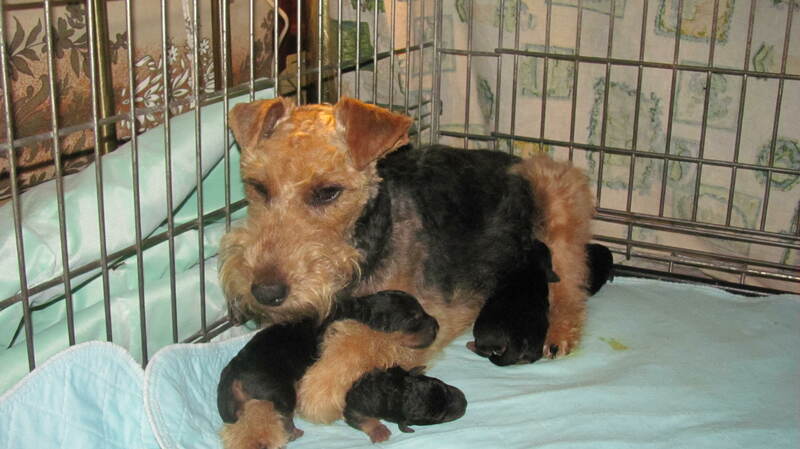 Miss Tegwyn has been confirmed with 6 pups due about St. Patrick's Day. Seems a lot of holiday whelpings around here. We do love the holidays! Please give a call 276-677-3851, or e-mail kissingrock at va dot net, if you want to chat about the possibility of adding a pup to your family. 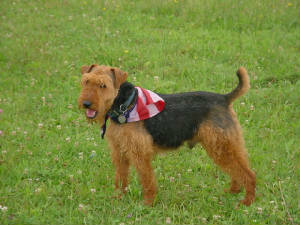 Clyde (pictured below) is once again the sire. That was a lovely cross, and we expect this litter to be very nice as well. Two pups are under deposit. 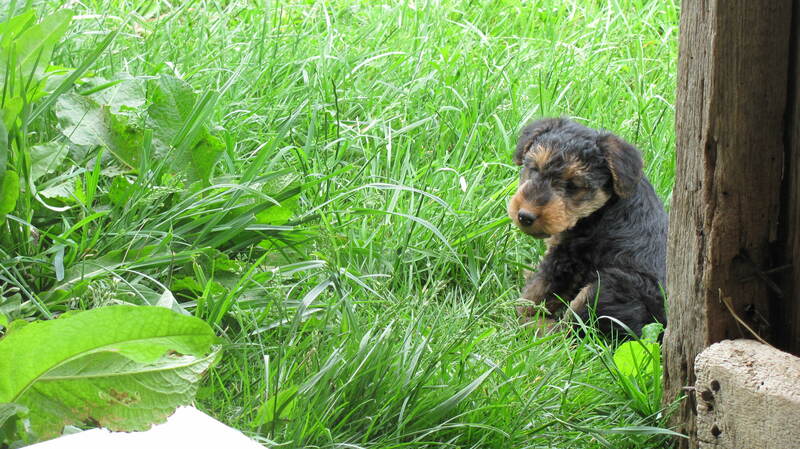 Price is 975usd, microchip included. A 2 year health guarantee concerning genetic defects is offered. 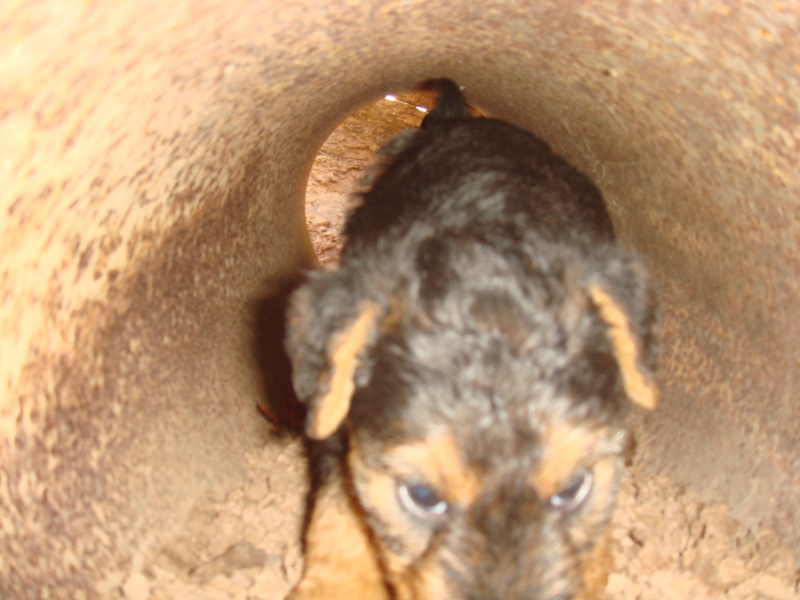 If you're looking around, but not yet ready for a pup, please consider getting in touch about the next litter. 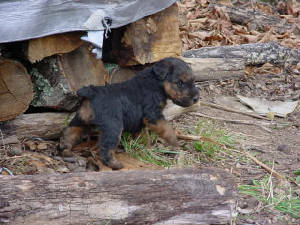 Vala should be coming in sometime in June, and a breeding is planned. We invite you to scroll down and feast your eyes and heart on our history. Enjoy! Good date. 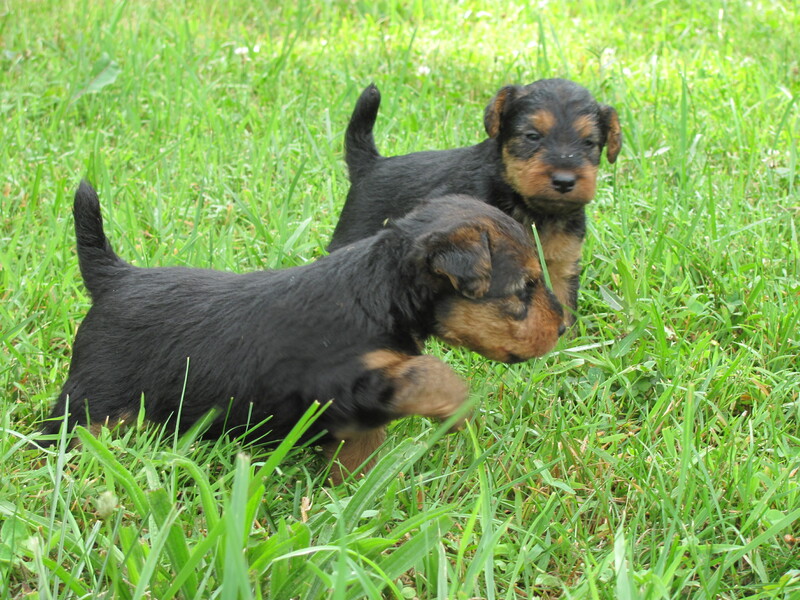 Pups are 4 weeks, 4 days. They're starting to explore a bit. 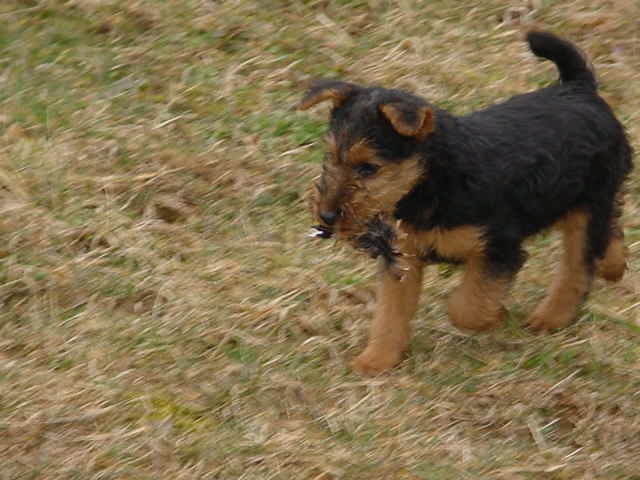 Hoping the weather is good to us, we'll hit the farm for a real puppywalk over the weekend. Right now, it's mostly pupstandarounds while they sit on my feet. Or retreat to the safety of the basket trolly. Our little stand around started when things got a little rowdy after nappy-time. "All ur kages are belong to us. I iz plottin eskape." I like to keep the canine "plottin" to a minimum, so figured I'd just take them out right before the gloaming. 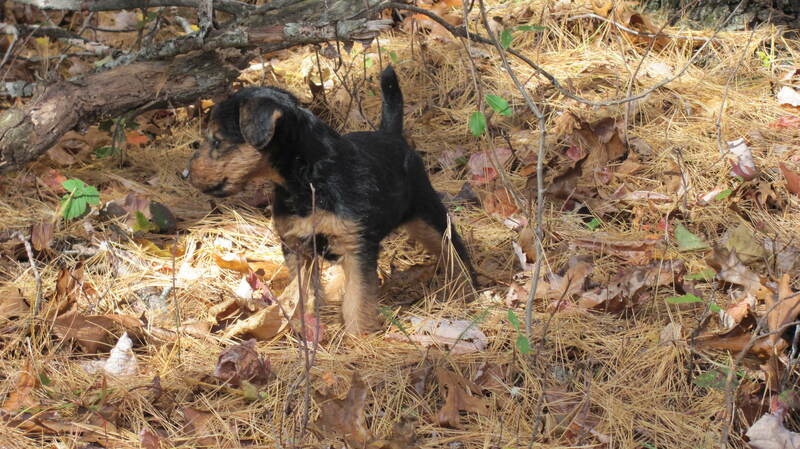 Wynnie is being bred to a cute little feller named Clyde. 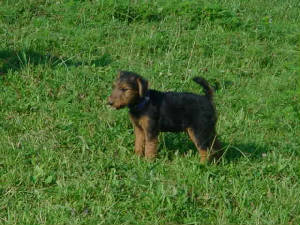 I'm excited about the cross, and look forward to pups in late August, reaady for homes in early November. Please give a call if you're interested in adding a Kissing Rock pup to your family. 276.677.3851 or e-mail kissingrock at va dot net. All of the June litter is placed. They all found homes quickly, all but one before birth! They're now 3 weeks old and just starting to get their cute on. Like this! WE IZ IN UR BASKIT, STEELIN' UR HART. It's Spring, and I thought I smelled puppy breath on the breeze this morning! Meanwhile, please enjoy scrolling down and checking out pictures of Val's last litter and the rest of the pack. 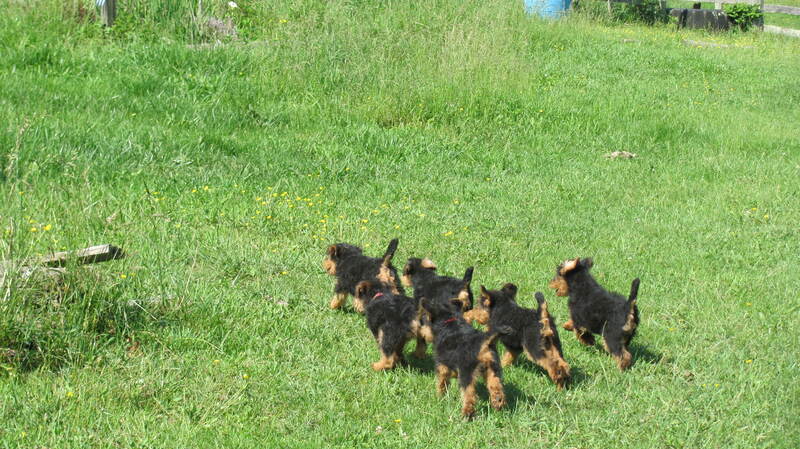 Val's litter have all in their new homes. Reports are all good. One little guy is even helping his dad play the piano! With his head resting on pedal foot, bobbing up and down. Now that's loving support. click on me to see a larger image! 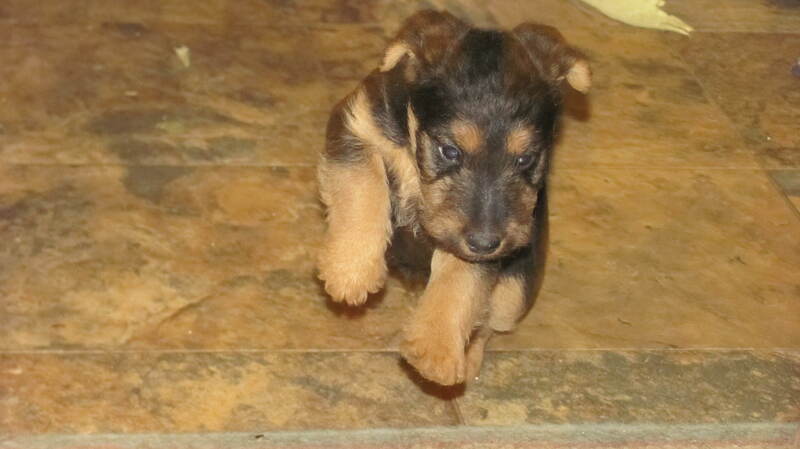 Time flies when you're breathing puppybreath! 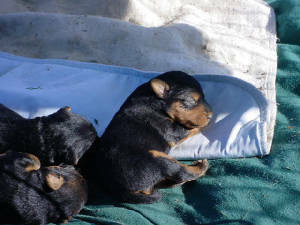 Val's pups are 2 1/2 weeks. They've had their nails clipped, and are outside sniffing the breeze. Their eyes are just open, and they're making a great effort to stand upright and motate around to investigate their surroundings. Mama Val positions herself strategically, ready to act as the lunchwagon, should she be called upon. Meanwhile in Ohio, Mr. Cuddles (on the left) has found a great home in Hawaii! He will be waiting patiently while the humans jump through all the hoops that moving to a rabies-free environment requires. 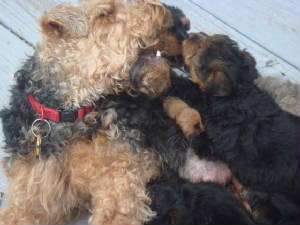 Mr. Fluffy and Mr. Fuzz (center and right) are still available to become the new member of your family! 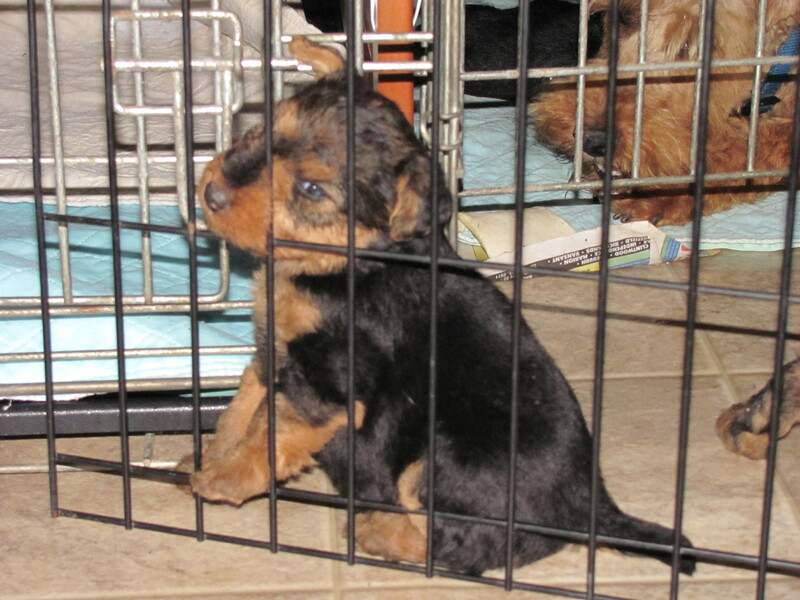 Please e-mail to kissingrock at va dot net, or call 276.677.3851 to inquire about any of the pups. 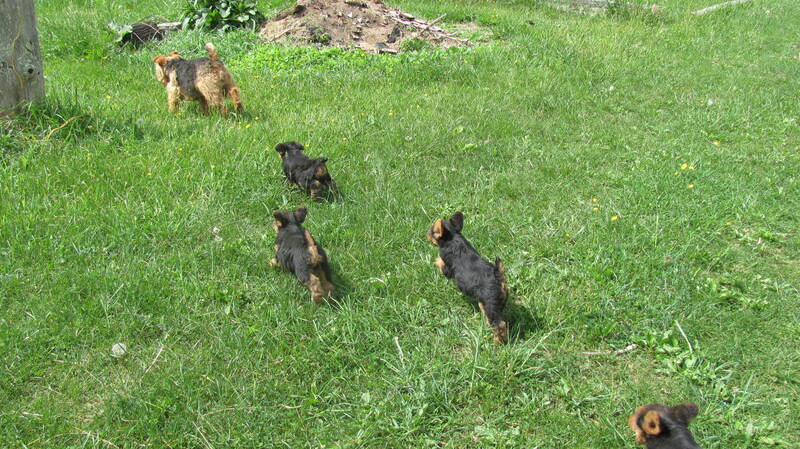 Mattie's and Glad's litter is scampering around acting like little terriers. Imagine that! Oh, you want this Ivy here? Resting up for the next go-round. 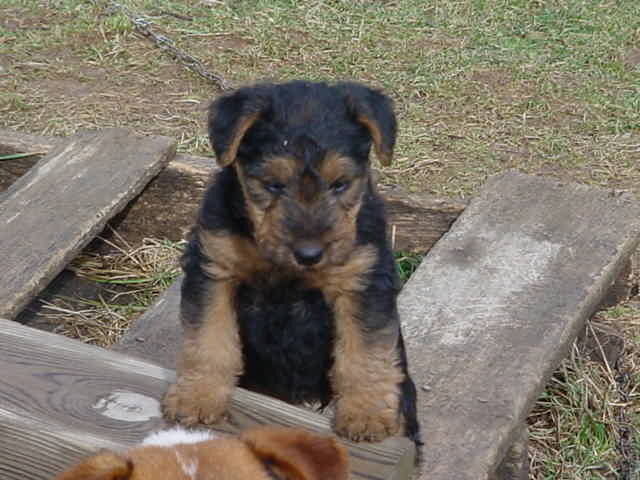 Vala is due sometime next week, and we eagerly await pups! 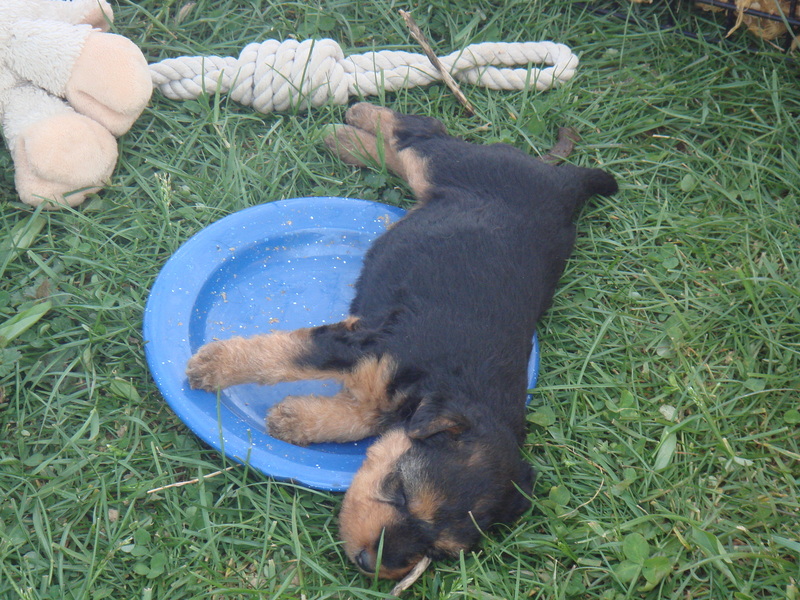 All that play makes for tired pups. Until next round. The female and one male are under deposit. 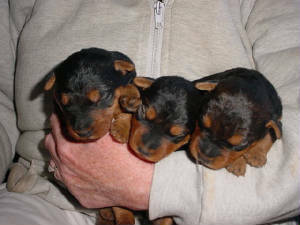 Three males remain available. 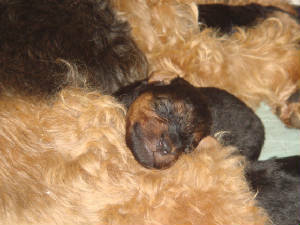 One female in Val's coming litter is under deposit. We're always happy to talk to you about possible purchase of a pup. Please give a call to 276.677.3851 if you are interested in exploring the possibility of a Kissing Rock pup. 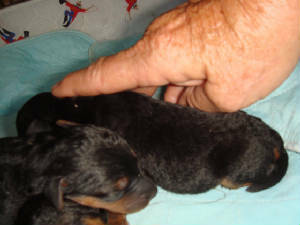 Mattie presented us with 6 pups on 7/19. She had 5 boys and 1 girl. All are doing well. Congratulations to Mattie, Glad and Sandi. Mattie did most of the work, but Sandi did the heart wrenching, hand wringing, standing by to help work. No small deed. Please let us know if you are interested in talking about the possibility of bringing one of these pups into your family. Vala has also been bred to Gladwyn, ultrasound will be done in about 30 days. 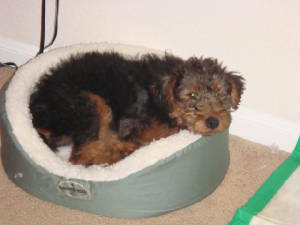 Mattie has been bred to Gladwyn and has had an ultrasound that reveals at least 4 pups. 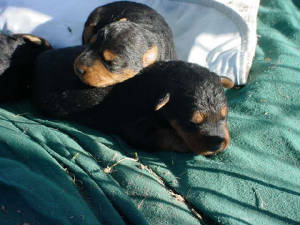 They should be whelped around July 15th, and be ready for their new families around mid September . 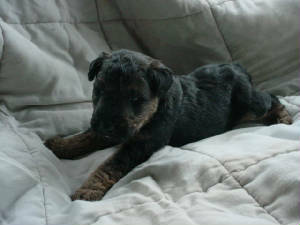 This is the same cross that produced Tegwyn (Wynnie) who gave us a great litter last winter. 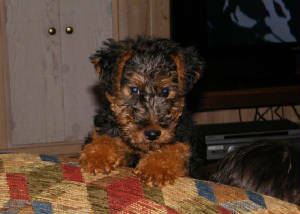 Please scroll down for pictures of Mattie at the 6/22/08 entry. The pups will be born in Ohio. They will have all usual vetting, tails docked, etc. Shipping is not an option, but arrangements can be made for assistance with pick up. 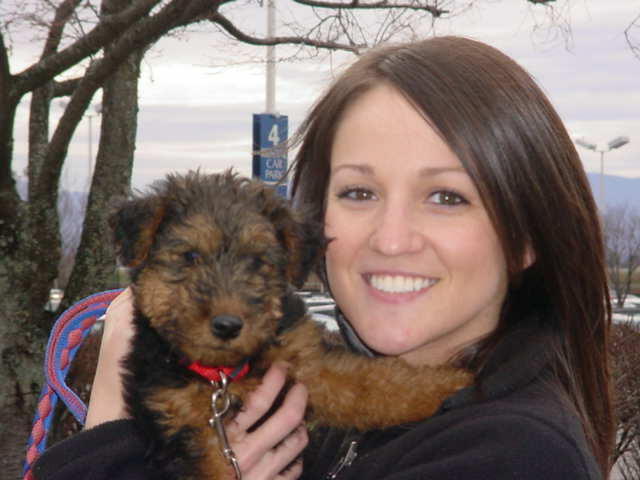 Pups are priced at $1,100 with limited AKC registration. Regular regristation can be discussed if you wish. Please give a call or e-mail. 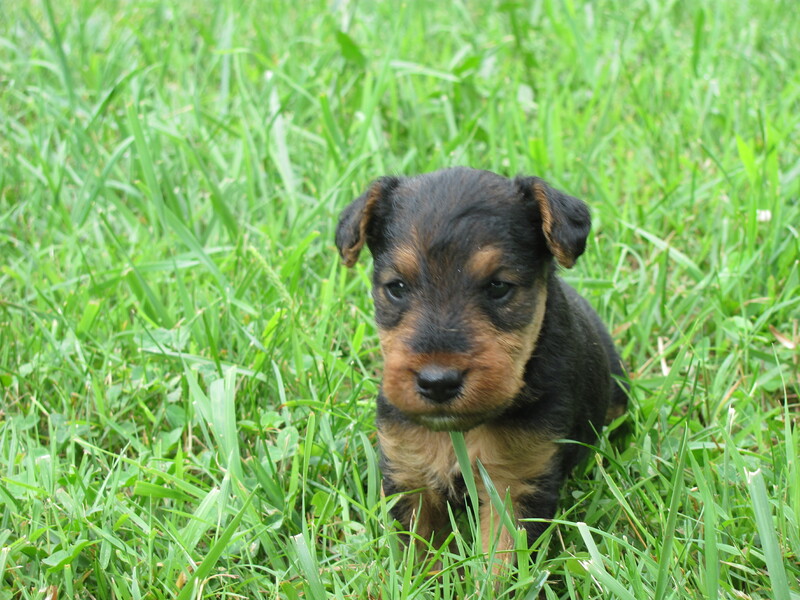 We're always happy to speak with you about a pup. Phone is 276.677.3851 and e-mail can be sent to kissingrock at va dot net. Isn't he a fetching boy? 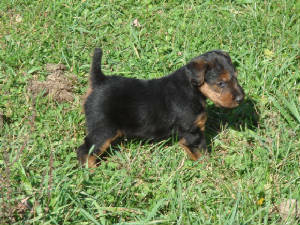 Vala is starting her heat, and will be bred as soon as she will stand. Inquiries about this litter are welcome. 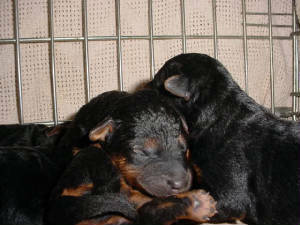 If all goes well, pups should arrive late August, and be ready for their new families around the end of October. Click Val's picture to see larger. Click Glad's picture to see it larger. 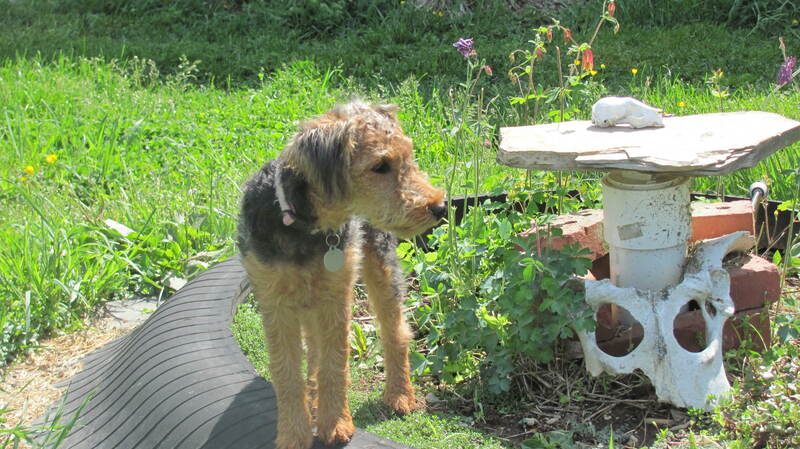 When Wynnie and her 6 finally got outside, they were ready to explore. The snow finally melted, and created ponds where none had been before. 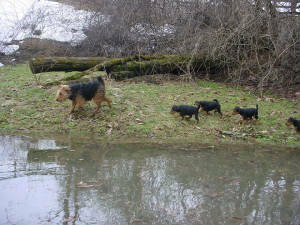 Here mom leads the pack around the edge of a new sinkhole "gathering of the water". 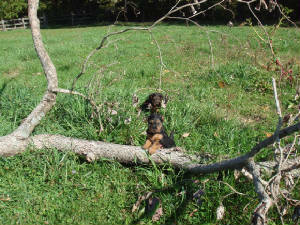 Some pups took right to it, a few were a bit more cautious. Eventually, everybody figured out that the stuff was pretty much like what they'd been offered in a bowl, only it was BIG! 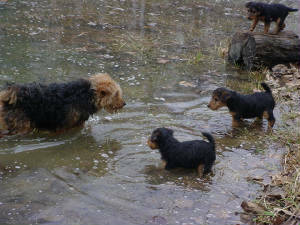 Once the pups got used to the idea of such a large bowl of water, some enjoyed a dip, while others opted to just get a much needed drink. All that playing sure does work up a big thirst. 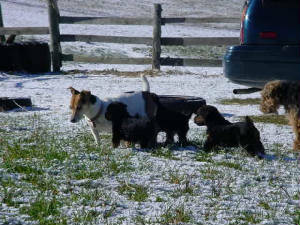 Here is Miss Pip teaching some hunting skills to those silly black and red pups. 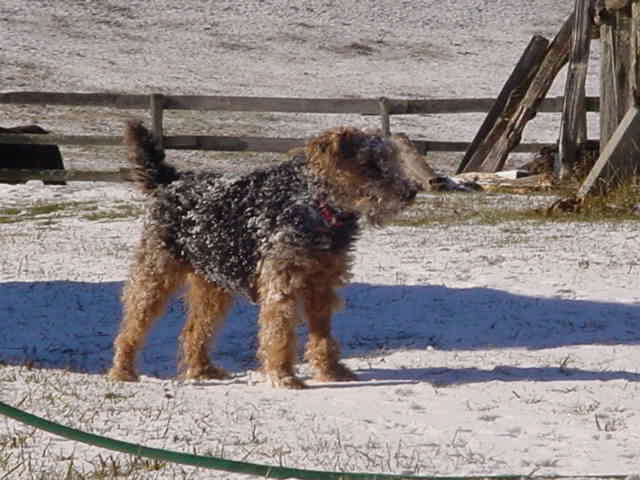 Pip is perhaps the most avid hunter of the Jacks, and is quite good natured about sharing her snuffling and digging skills with the Welshie kids. I have been a bad, bad webmistress! 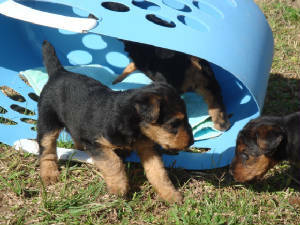 Fanny's pups went to their new homes around Thanksgiving. Wynnie went on "vacation" to Florida at that same time, where she met her first husband, Moultrie Creek's Toi Thai Gurr, or Tiger. She came home carrying pups. 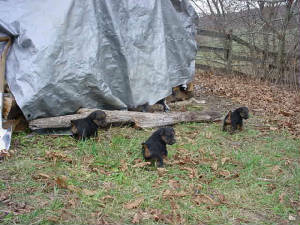 The little guys and girl are now 4 weeks old, and wanting to figure out this big place they've come to. Always wanting to oblige, I've had them outside in the snow. Sun shining, warm enough... When we came back in, they seemed very proud of themselves for doing so well on their first big Adventure. 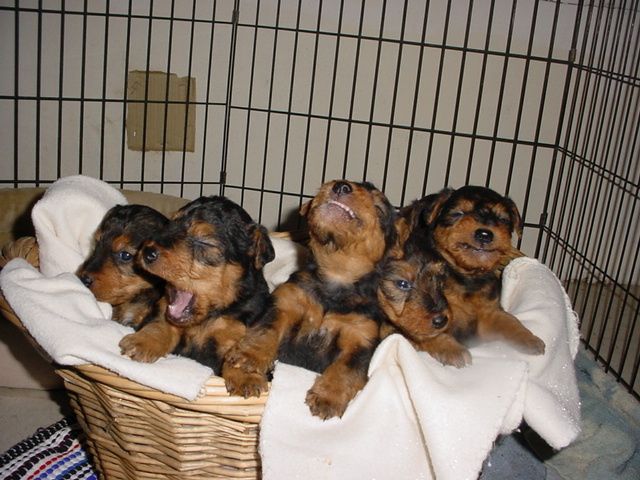 First, put all the pups in a blanket lined laundry basket. Put that pup back in. Put the other pup back in. 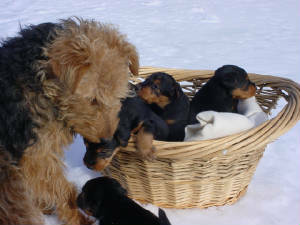 Quickly, lift basket while all pups are in. 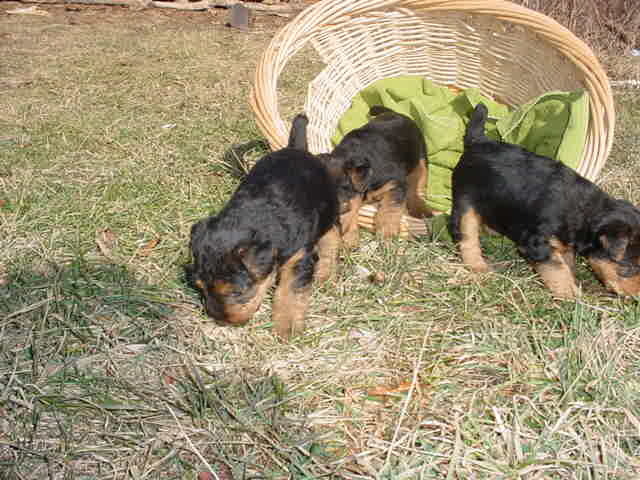 Shake basket slightly to settle pups at bottom and walk quickly outside. 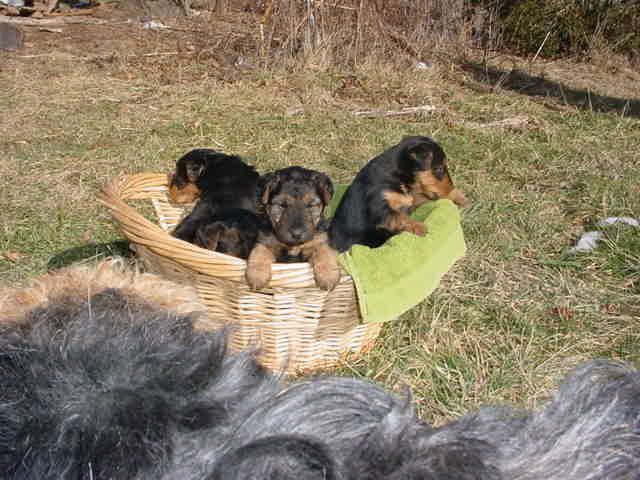 It's not rocket science, but with 6 lively pups, one usually tries to exit basket without notice, so it can be tricky. Once outside, set basket down and step back. Get ready to click! First order of business for Wynnie is to count pups and make sure everybody has made the trip, and they are all in good health. I could not be more pleased about her emerging mothering skills. Yup, looks like everybody is present and accounted for, and in good spirits. Eventually, Wyn is satisfied with her brood's condition and location, and walks away. 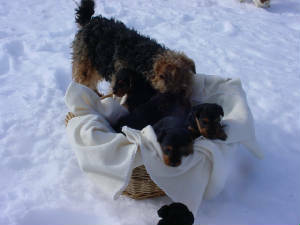 The pups find it hard to follow with that basket all around them, and eventually, over it goes, gently, and pups spill out onto the ground! They look around, get up and off they go! Hey! Where's Mom? I'm hungry after that long trip! Are you hungry? I'm hungry too. Let's find Mom. Hey! There she is! Let's get sumfin to eats! Yeah, I'm starved! There she is boys! Let's go! Hurry, or you'll not get a good seat at the table! Eventually, everybody is satisfied, and they're off again, exploring their new surroundings. I'm looking forward to seeing how they react to the ground. Right now they think the world is white and damp and cold. I hope I can capture the sense of amazement that they will have when smells sharpen and fill their little noses and brains! After a short romp, the human decides that it's time to load back up for the trip into the house, and so the process is reversed. Wynnie pays close attention to the proceedure, and insures that no one is left behind. 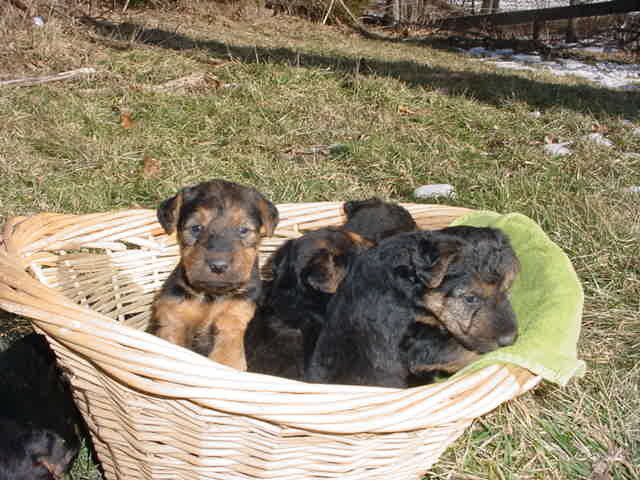 All pups in this litter are under deposit. 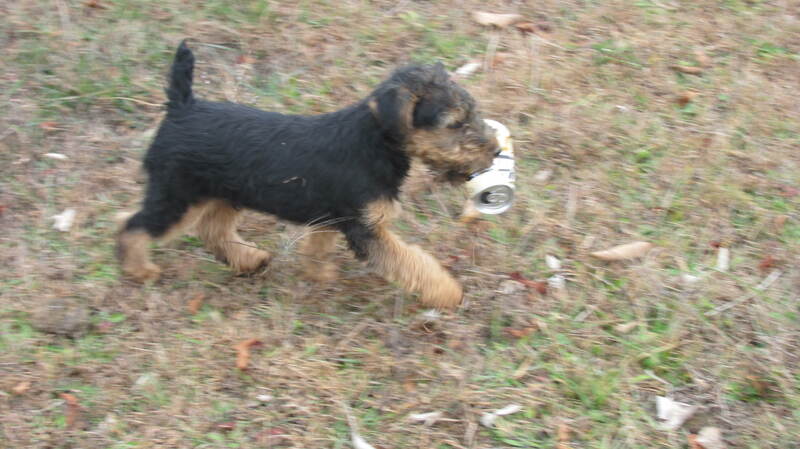 If you want to inquire about the next litter, please call me at 276.677.3851 or e-mail kissingrock at va dot net. 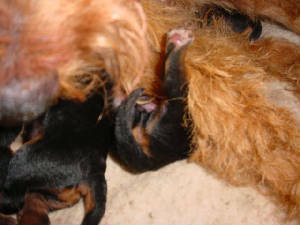 Please scroll down to view pictures and information on previous litters. Thanks for stopping by, and please feel free to call me with inquiries or questions. 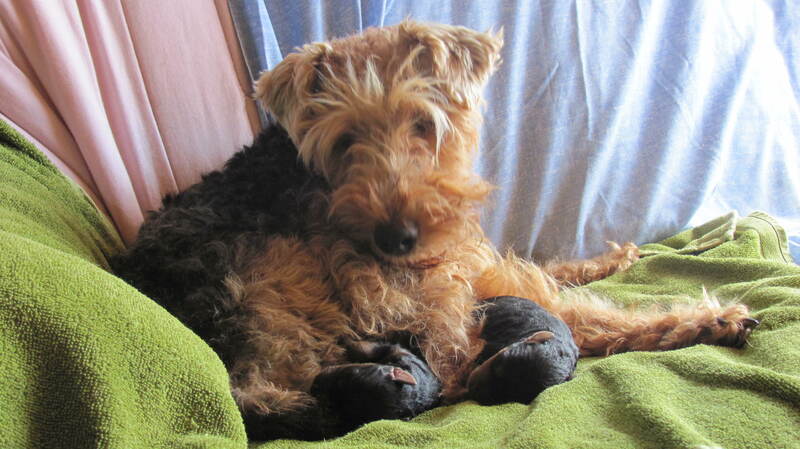 Fanny has had her ultrasound, and has been found to be carrying only 2 pups! Both have deposits pending. 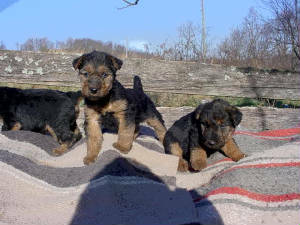 Our next litters will be in the late Winter/Spring of 2010. 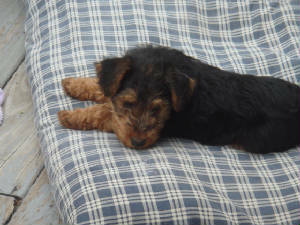 If you are doing some advance planning for a pup, I'd be delighted to hear from you! 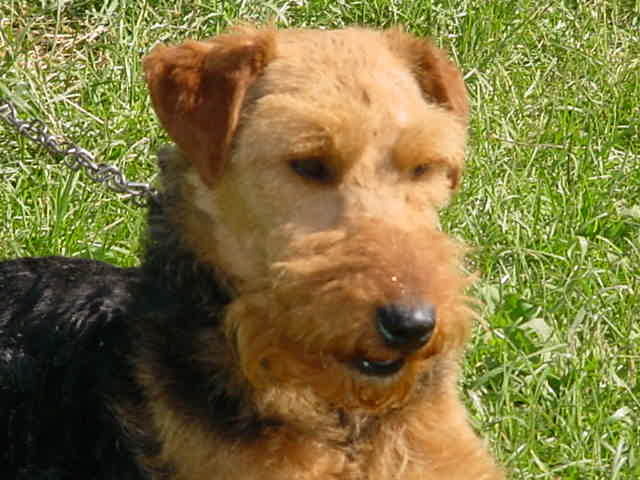 Fanny has been bred to Gladwyn. All going well, we should have pups born mid September, ready around Thanksgiving. And we will be giving Thanks, as always! She will have ultrasound at around 30 days. 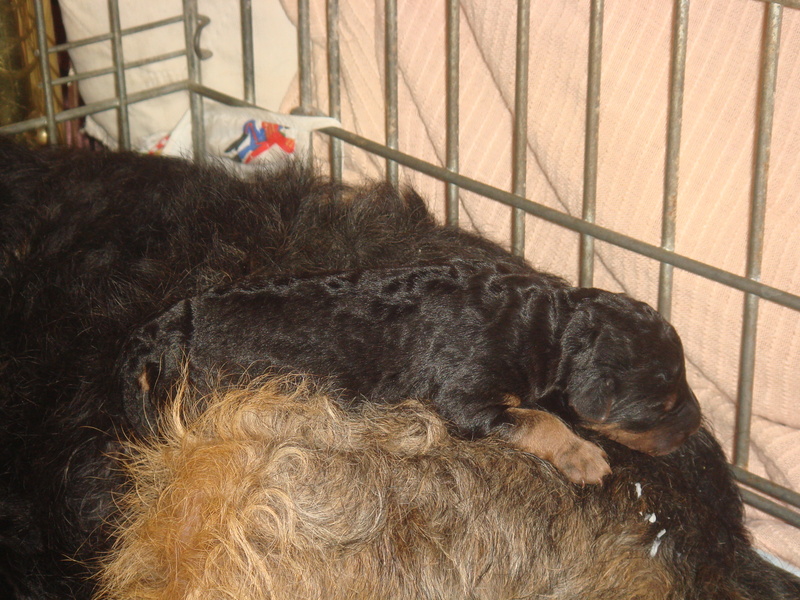 Vala had 4 beautiful pups on the 20th. Three have been sold, and the fourth has a deposit pending. 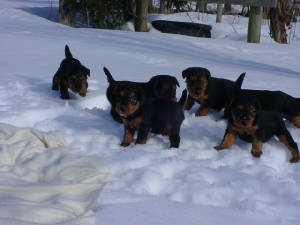 Thank you to all who are inquiring, and please let me know if you'd like to be put on the list for the next litter. 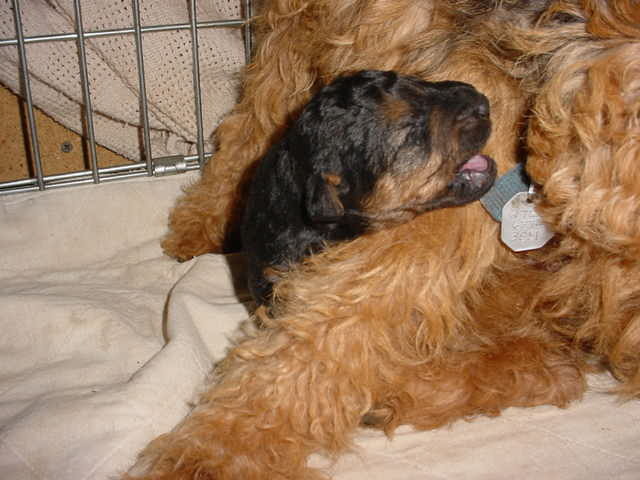 Meanwhile, please scroll down and enjoy the history of past litters. This picture brings joy to my heart. Why? 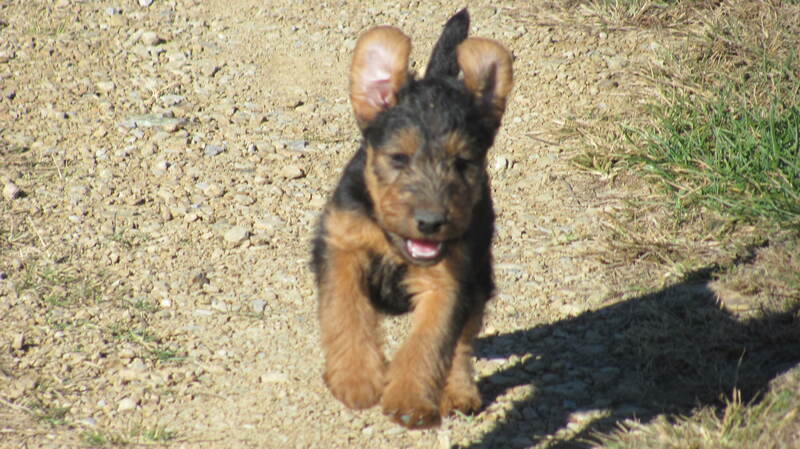 Denbigh pup is getting exercise, and plenty of it, by the looks of it. That's great, and necessary for a healthy body and mind. And it's great that Aaron is getting some at the same time. But look closer. See that red to the right of the pup? That's his leash. Although Denbigh is "at liberty" and running with his pack leader, his brilliant leader has left a handle on the dog, and this is what thrills me so. Pup protection rules, or it should. Tragedy can happen in a heartbeat. Little things we do can make our furry friends safe as they learn to navigate the new world, and become responsive to us. Thank you Arron. I sleep better at night, knowing how much you care, and that you are a thinking dog-man. I'm always amazed at how little they are! Getting good pictures of these littles is always a surprise. Sometimes you just get feet. Great moments are fleeting, as was the one when both Glad (above left) and Vala (right) gave a kiss at the same time! "Fleeting?" they ask. "No, not us, we're here to stay." Young Tegwyn kisses too. There was just not enough room in Barbara's arms. Be assured, she did get her turn. Vala will whelp mid/late April. 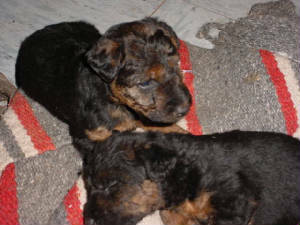 Two pups are reserved by deposit at this time. 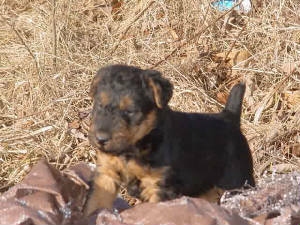 If you are interested in a pup, please mail to kissingrock at va dot net, or phone me at 276-677-3851. 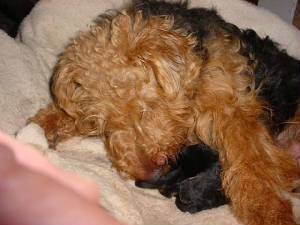 Her vet saw 4 pups on unltrsound. We're all looking forward to seeing them on the ground. Spring pups. What a delight! 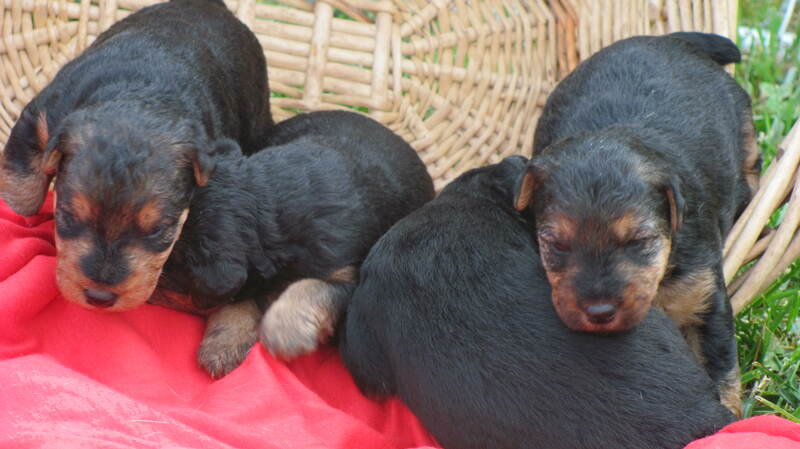 The pups from Fan's litter are all thrilled to be in their new packs. As Isabel says about Kevin........"I think he likes it here!" 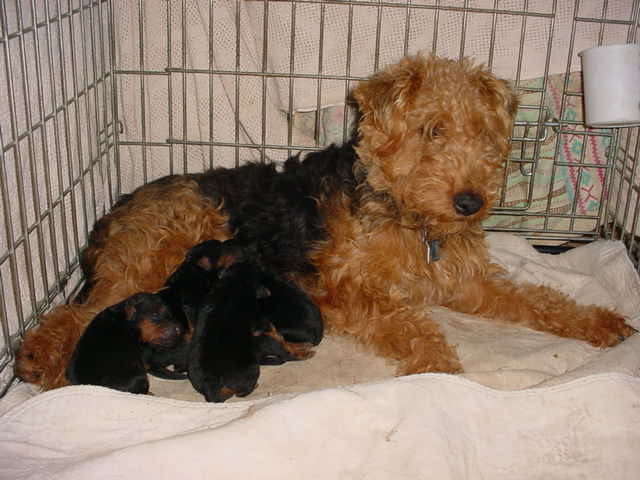 Fanny had three pups in late December. 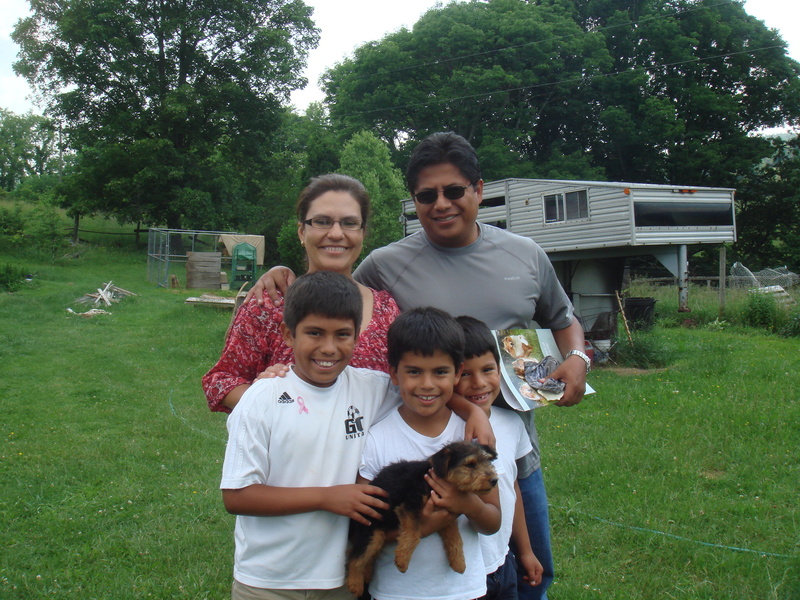 All are sold, and new families are containing their excitement until the last weekend of the month. Thank goodness February is the short month! 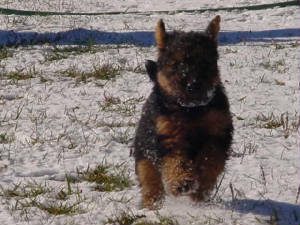 Vala is coming into heat, and will be bred when she will stand. Here are the boys and girl. Kevin, Denbeigh and Kasey. 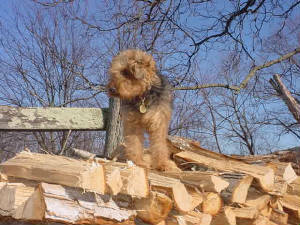 Fanny keeps a watchful eye on the pups as they explore the smaller wood piles. These are some brave 5 week old pups! 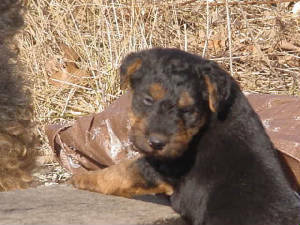 If you think you may be interested in a Kissing Rock pup, please inquire. Mail to kissingrock at va dot net, or phone 276-677-3851. 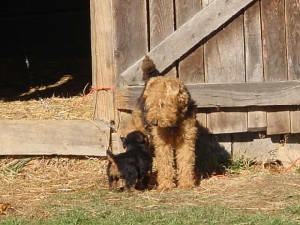 Vala's pups will be by Gladwyn. If all goes according to schedule, they should be ready for you mid/late June. Puppy breath RULES! What a crazy late summer/fall it has been! Fanny was due to come into heat in late August, but did not. September passed. As did most of October. 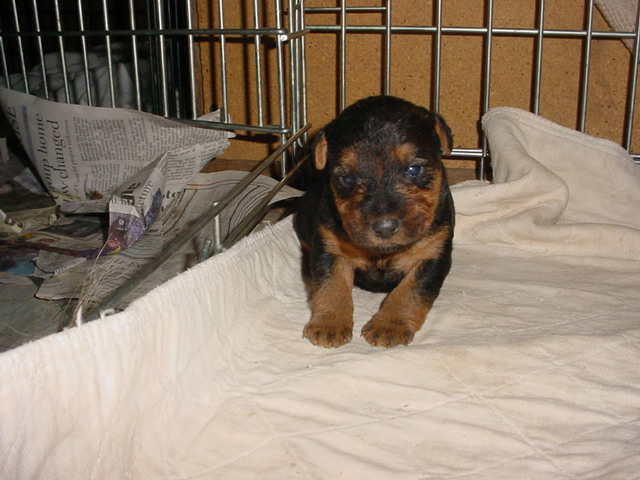 By the time she got bred, 4 pups were sold! Meanwhile, Tegwyn arrived from Ohio. What a little beauty she is! Gladwyn's daughter, and it shows in her quiet intelligence, and her lovely body. 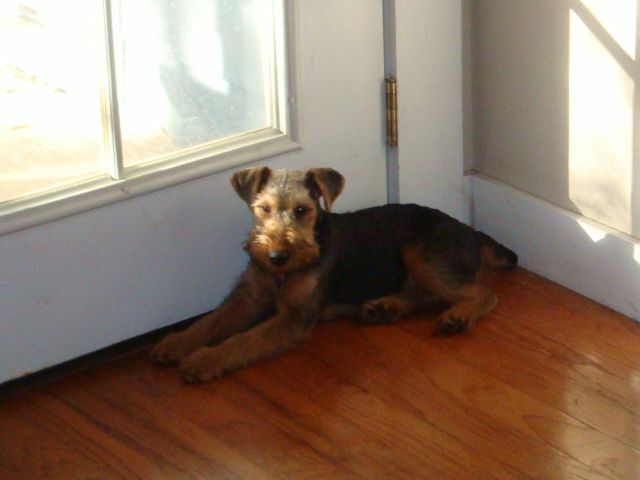 She's square, and at this point, quite the little chunk of Welsh Terrier. Vala is her best buddy. 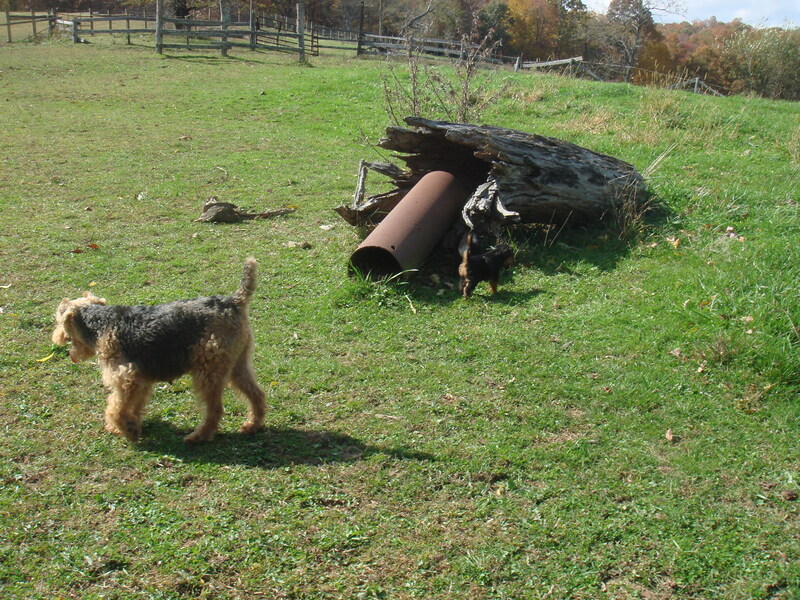 They race around the farm like dogs, keeping the squirrel and rabbit population in line. 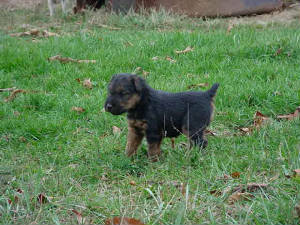 Next breeding should occur in January, when Vala comes in. Of course, there are no guarantees on that, as Fanny just showed us. But please mail if you'd like to be notified. 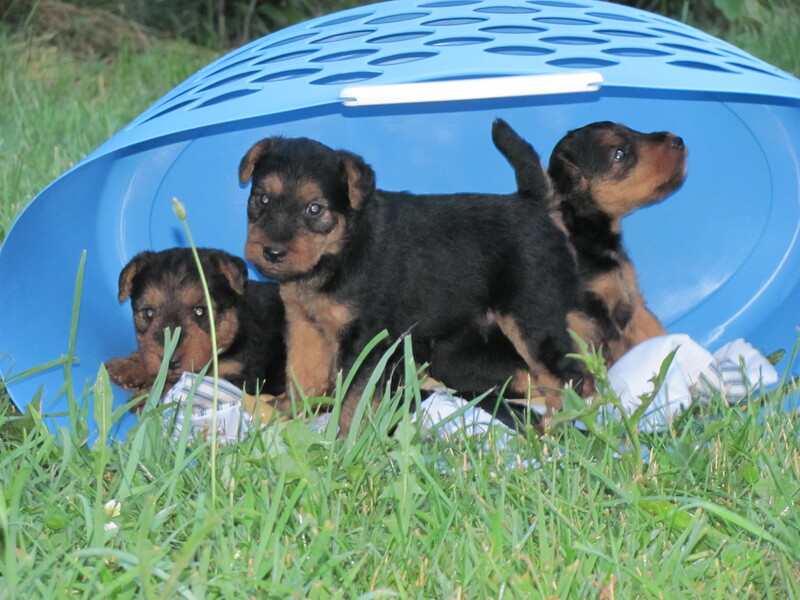 All pups in the June litters are reserved by deposit. 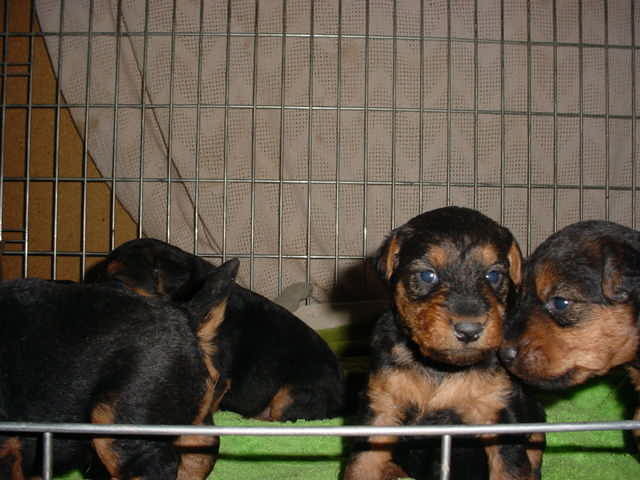 The next planned litter is an August breeding, with pups available around Christmas if all goes well. Please scroll down to visit with the Kissing Rock Welshies, and mail us if you are interested in someone from the next litter. Thanks for visiting. Mattie graced us with 6 pups Friday morning. 3 boys, 3 girls. Everybody is fine 2 days out. 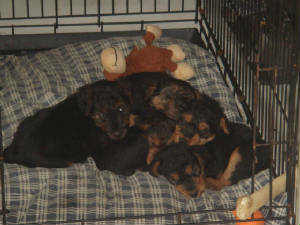 5 of the little black blobs are reserved by deposit. One male remains available. It will be an exciting summer, as we watch closely for their personalities to start to come out of there, and determine who goes where. 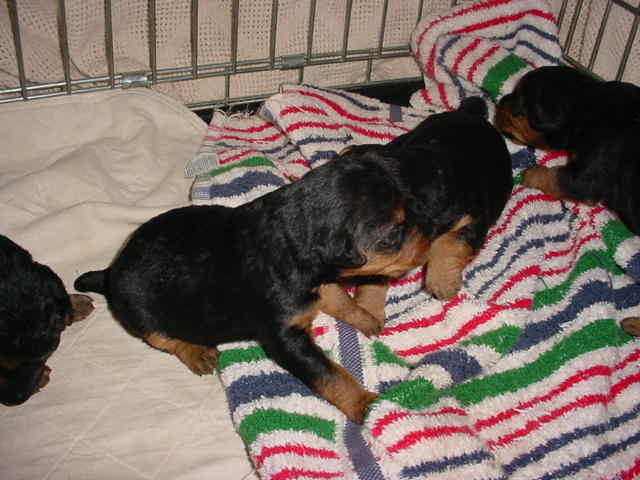 And of course, to see how these little blobs grow into the beautiful dogs their lines produce. 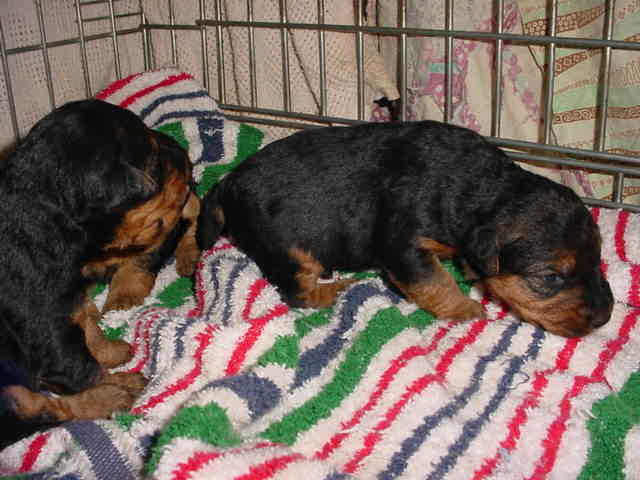 Gladwyn has been bred to Mattie, who is a Fanny daughter out of her second litter. 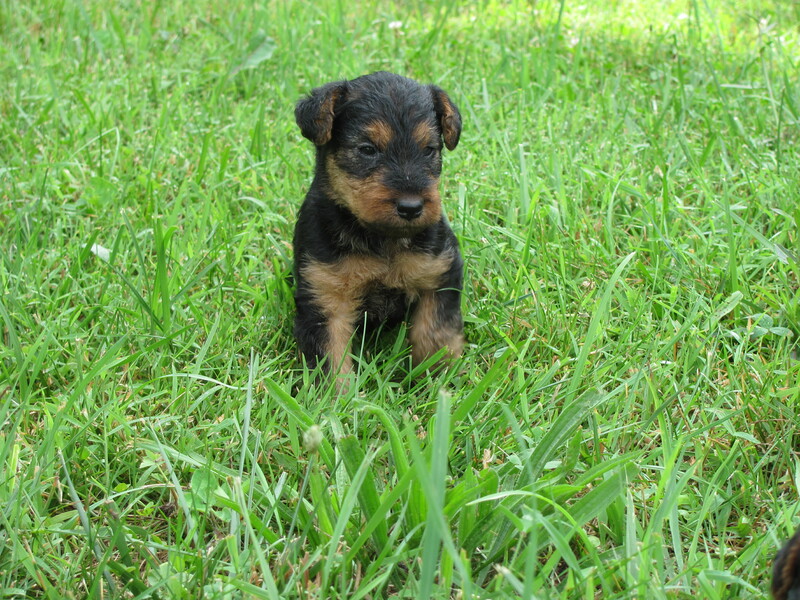 We're very excited about this litter! Mattie is a beautiful girl, correct, and with a fun-loving and vibrant personality. 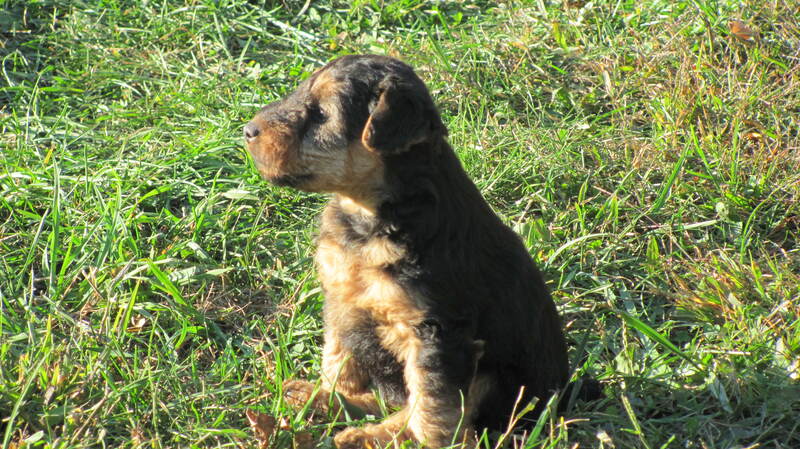 If all goes well, she will whelp late June, with pups ready for you in late August. 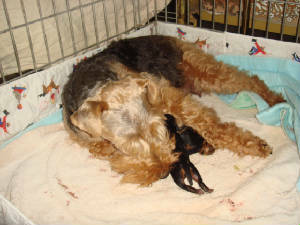 Mattie has had an ultrasound, and is carrying 6 pups. They will be whelped in Ohio. 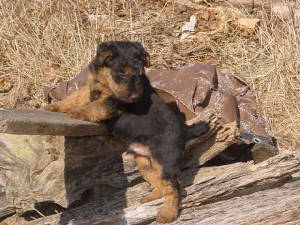 Pups are priced at $1,000 with limited registration. 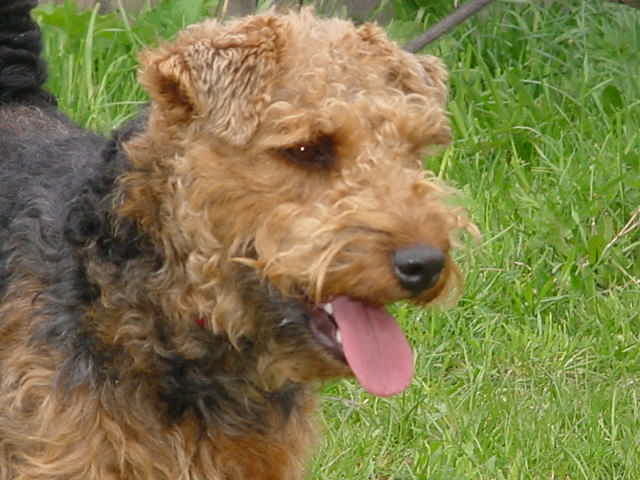 The owner prefers not to ship, but delivery in late August can be arranged to some locations, and other methods of delivery can be arranged. Thanks for stopping by! 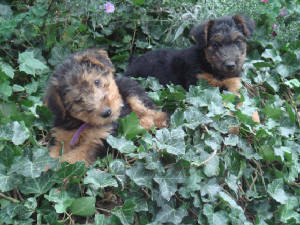 Please scroll down to see Fanny, Val and Gladwyn, and some previous litters. 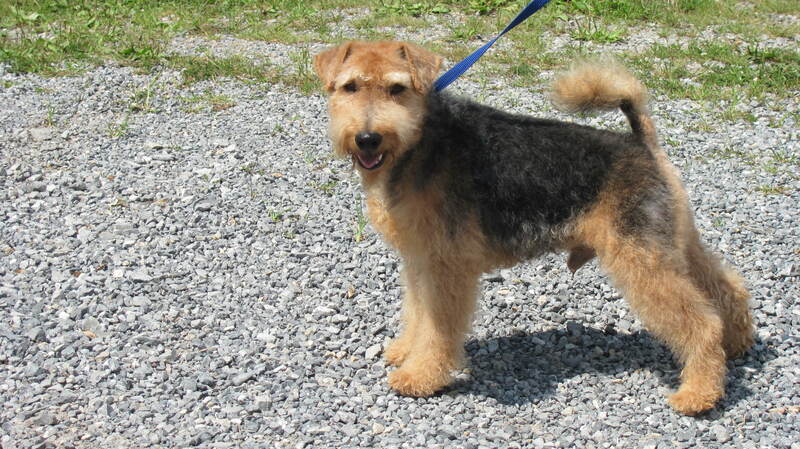 Here's Gladwyn wearing his new summer cut. Glad continues to develop into a lovely dog. He is earnest, honest, and oh-so-willing to cypher out what will earn him a "Good Boy!" All pups have been placed in fabulous homes! The girls and I are going to take a break until summer heats. 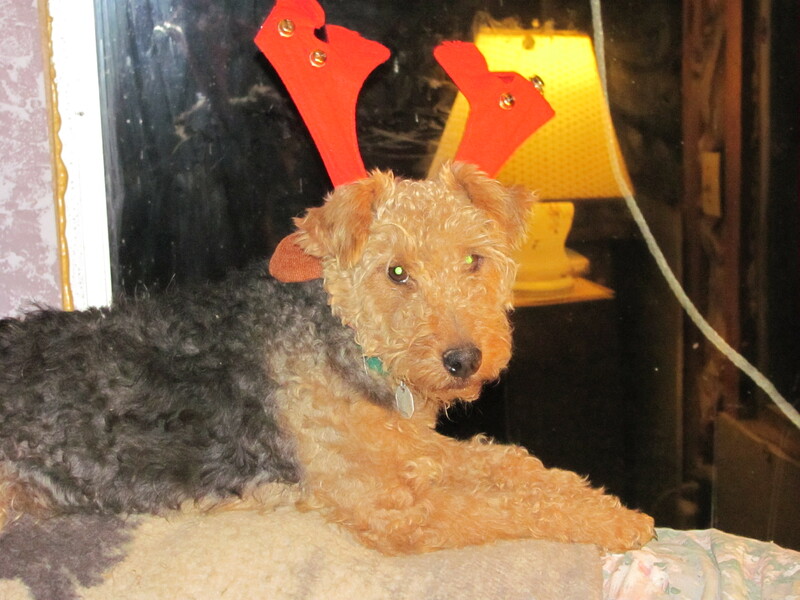 Gladwyn is NOT happy about that, but we ladies need it! 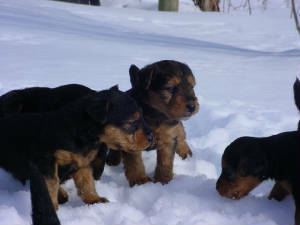 I expect to be breeding again come August, and have pups around Christmas. 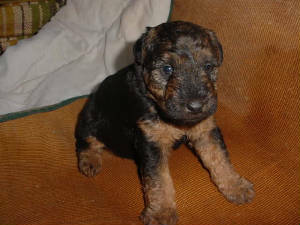 If you are interested in talking about the possibility of a pup around that time, I'm happy to talk to you at any time. One lovely girl awaits her new home. She is 9 weeks old, and a very elegant little scamp. 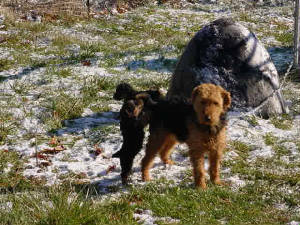 Here she is (on the left) last week, with her brother, who now lives in Tucson, Arizona. 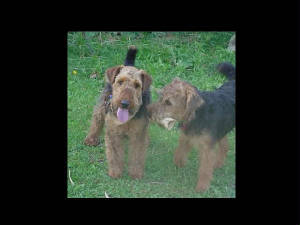 And the Terriers speak. 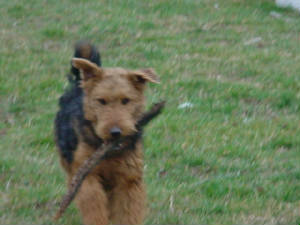 They say........"Well, you know Mom, we ARE Terriers, and if we happen to find a bit of bird who didn't make it, we will pick it up and trot proudly around with it. Deal with it!" So I deal with it. By taking their pictures. Here is that wise and elegant girl. Time flies when you've got pups! Everybody is so healthy and active that they really keep me watching where I run. At two weeks, we've grown quite nicely, and our eyes are open, looking around at our new diggs. We don't walk real well yet, but we're tryin'! 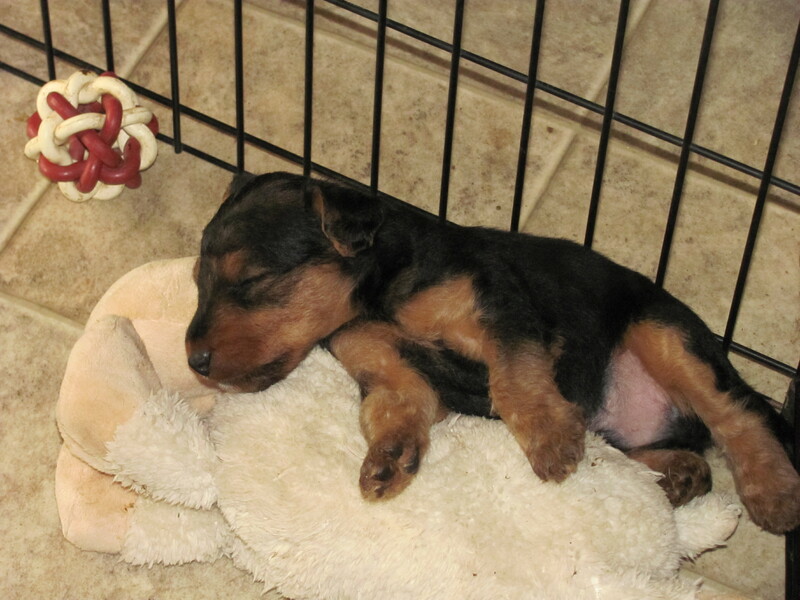 ..and snuggle up for naps. Lots and lots of naps. 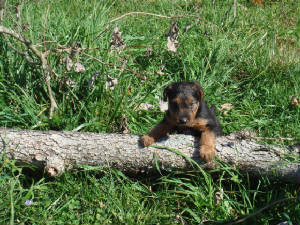 At three weeks, we're starting to get our legs under us, and learning to work them so that we can go where we want to. Like out of our kennel. Yes! We are learning to go Woooooooooooooooooooo! 4 1/2 weeks old. This is the first trip outside. Finally! The weather had just been too cold to get them out. They were ready! Into the basket we go. Looking around. Hey! It's big and strange out here! It didn't take long to get started exploring. First thing they wanted to know was "What's that white stuff?" 6 weeks old. 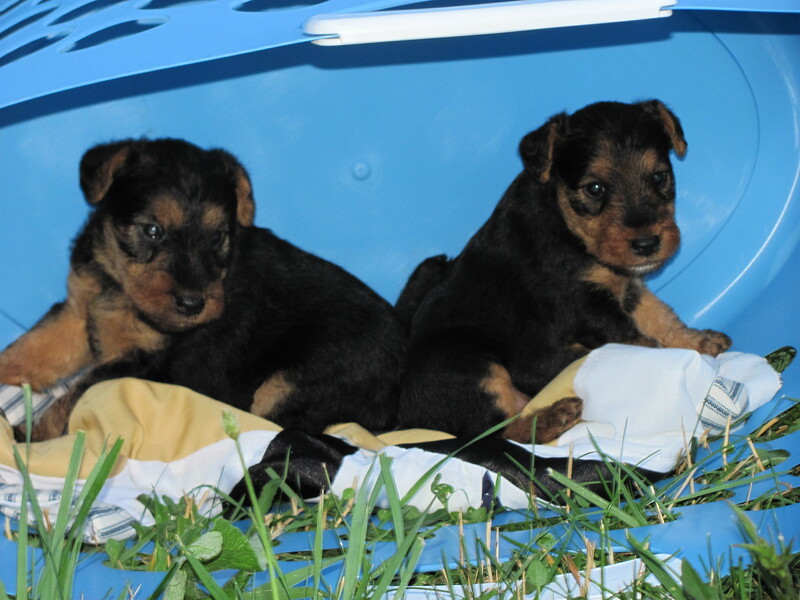 One male and one female remain available. 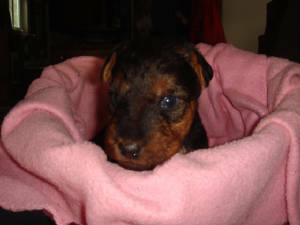 Please scroll down for pictures of previous litters and purchase inquiry information. Pups are here! 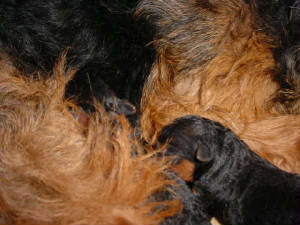 On 12/27, Vala whelped 5 pups. There are 2 males and 3 females. At 8 days old, they are growing fast and fat. 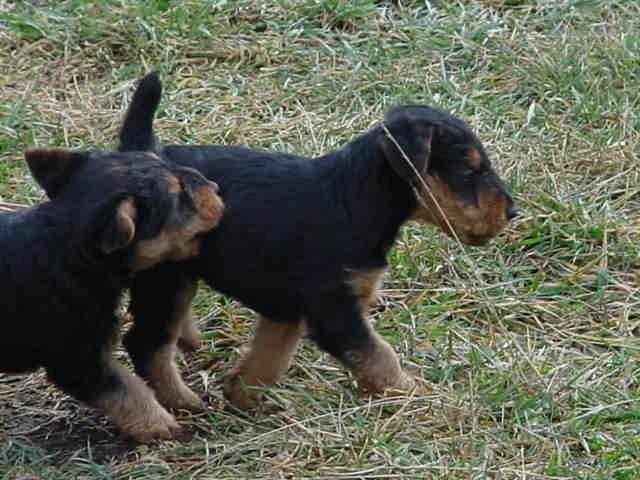 Their little coats shine with a purple hue, and they snuffle around, eager to see the world. For now they have to be content with smelling and hearing it. The boys are very masculine, with nice broad necks and shoulders. The girls display a lovely feminine look. 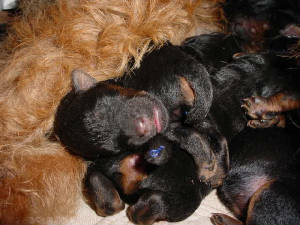 Vala and Gladwyn have produced a very nice litter! One of the girls rests between nursing and snuffling around. The boys just hanging around, waiting for their stomachs to tell them that they need to find momma. If you are planning to show or breed, please let me know, and regular registration can be discussed. 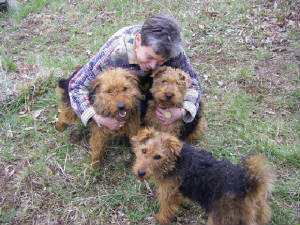 There are lots of pictures of Myfanawy, Vala and Gladwyn (Cactus Jack of Happytails) below. Scroll down to enjoy a trip through the history of Kissing Rock Kennel. Sigh. I am pupless for now. As nice as it is to see such happiness being brought to folks by these pups, it's hard not to feel just a bit empty-nestish. 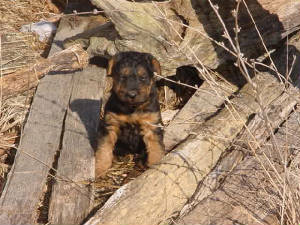 Little King Leonidas asks his new mom for a boost up off the chilly ground. Merry Christmas. Leo and Alexis, new best friends. 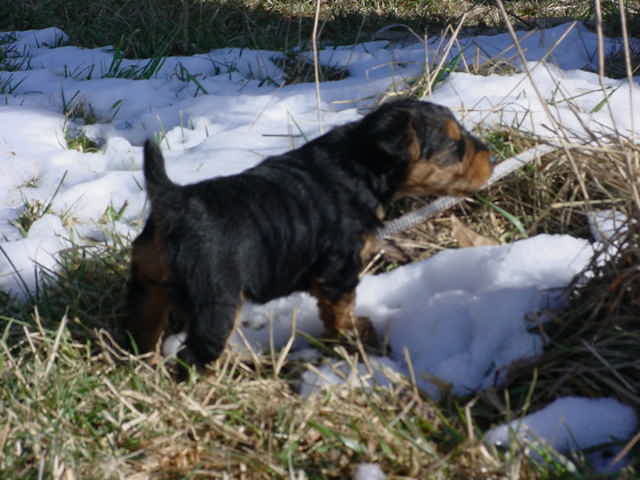 One of the joys of breeding is folks sending me pictures of the pups, all grown up! Here's little Leo, maybe not ALL grown up, but well on his way. Rags to Riches! And here is the handsome boy, just a little bit older, and with a proper cut. I am constantly amazed by how beautiful these fuzzy pups become. 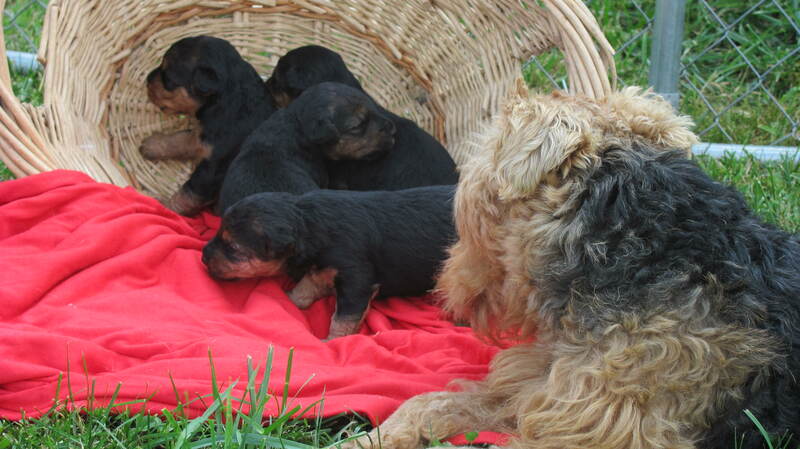 After a refreshing wallow in the new skiff of snow, Fanny keeps a watchful eye on the pups. 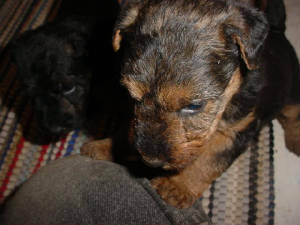 They are 6 weeks old, and they keep me, their Aunt Vala and Fanny pretty busy. Gladwyn is an interested and active daddy-dog. 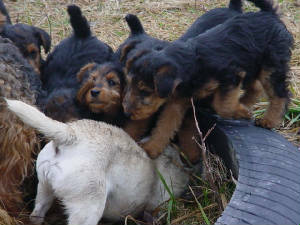 He teaches the pups the meaning of rough and tumble. 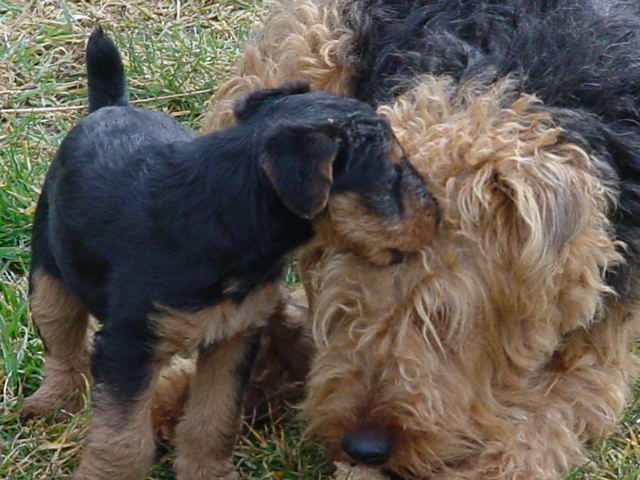 Learning to respect the Big Dogs is a valuable lesson for a little pup. Aunt Vala is a wonderful baby-sitter. She teaches the difference between fun time talkies and growly-face. Spirit flies at the sound of someone wanting to see her! All the pups are so anxious to please! And be hugged. 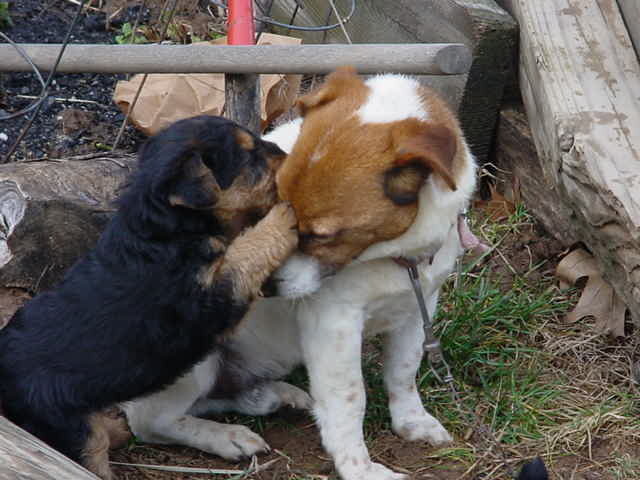 Give doggy kisses. All the pups like to help Fanny as much as they can. 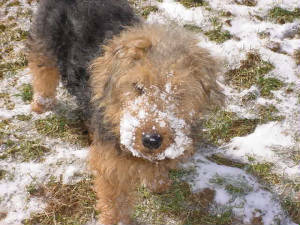 Huggy helps clean the snowballs off mom's foot. Or perhaps she is just being pesky. They do that to me too, even when I don't have snowballs. The Jack Grace is the primary teacher of the meaning of Ugly Face. 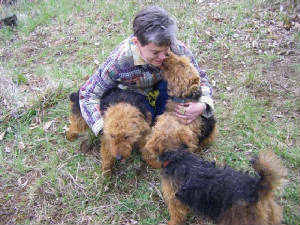 A veteran mom, she is invaluable to us in making the pups safe as they prepare for new homes. Fanny keeps a close eye on the lesson. 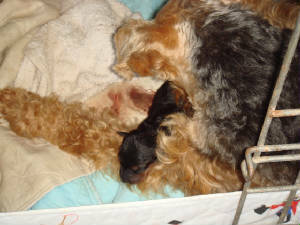 Fanny had 4 pups on October 21st. They are the cutest little black slugs! All are doing well. There are 3 girls and a boy. Congratulations to the new moms and dads! 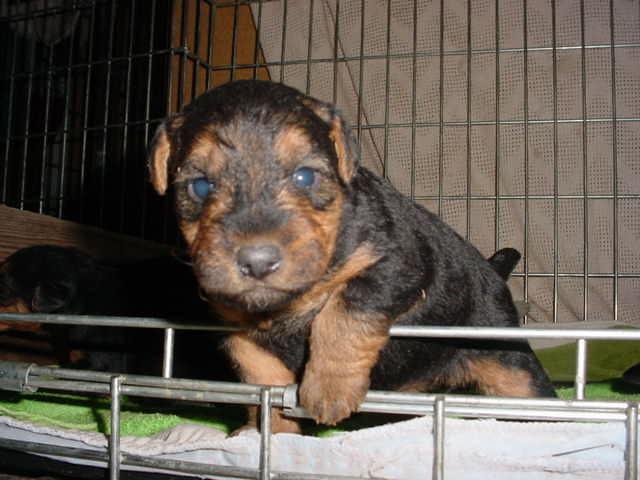 I'll be spending the next months getting to know the pups, and the new families, to insure a good match for all. 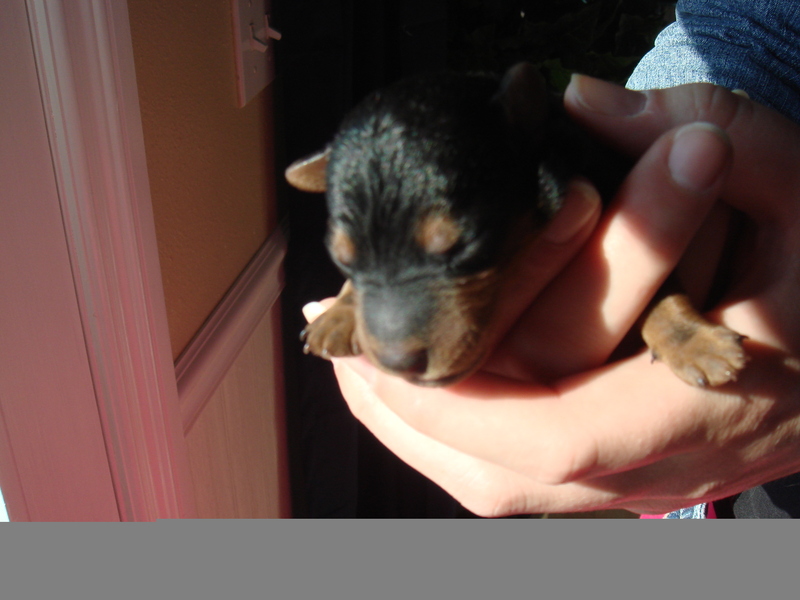 If you are interested in a pup, please scroll down to the September entry for information on pricing and deposit. 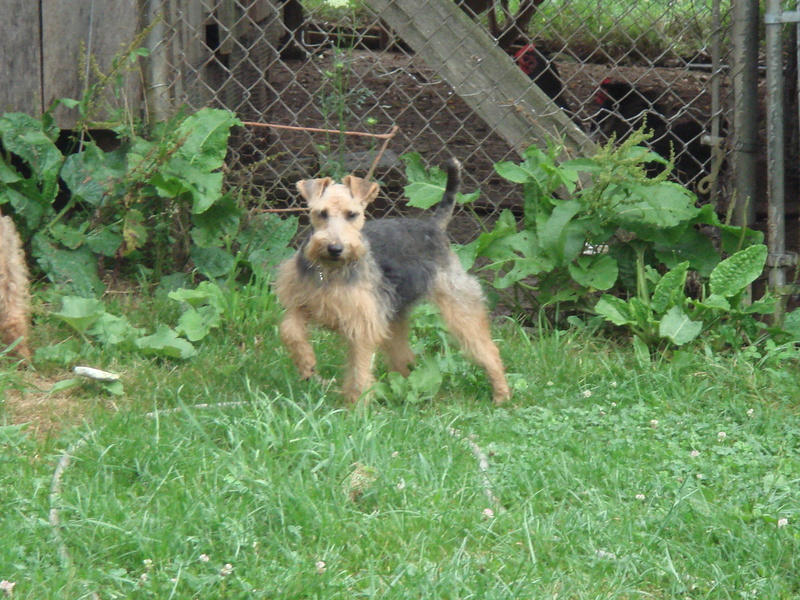 Fanny has been ultra sounded, and is carrying at least 3 pups. 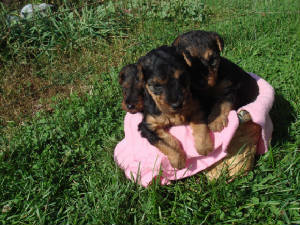 They should be whelped around the middle of October, and ready for new homes right at Christmas. HO, HO, HO! 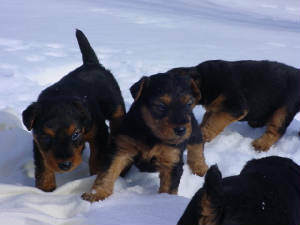 What's on my list for Santa are perfect homes for these little bundles of joy! 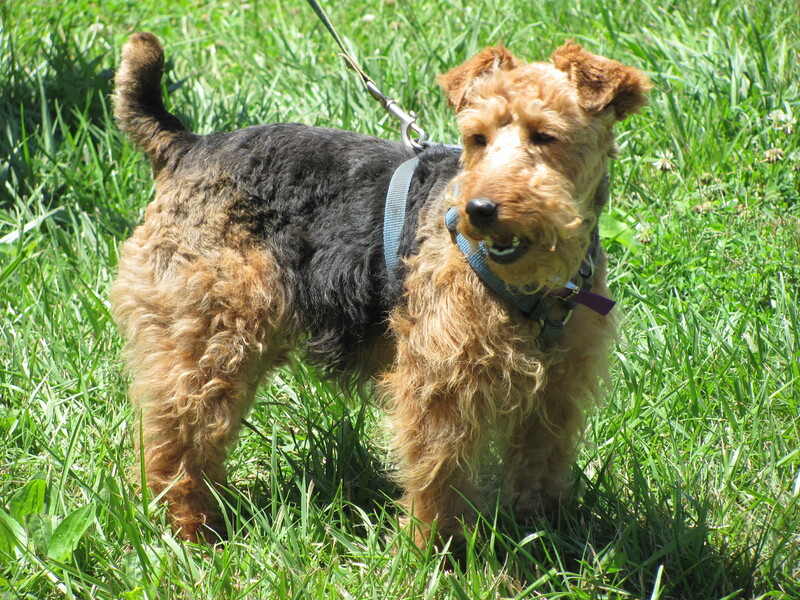 Fanny will want to know what you are going to do with her pup, where it will live, and if you know what you are getting into by bringing a terrier dog into your family. 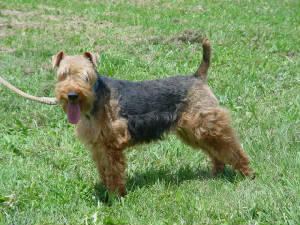 Gladwyn (Cactus Jack of Happytails) is the sire. If you are phoning, and need to leave a message, please see note below. To e-mail, please send to kissingrock at va dot net. 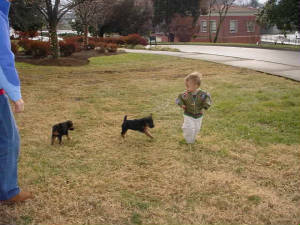 3 boys, born 4/27/07 They are beginning to walk upright! Gladwyn is the sire. Please scroll down for links to see his sire and some fantastic half-siblings. My answering machine does not recognize some voices, particularly if soft spoken. Please speak loudly if you leave a message, and tell your phone number at start of message. I've gotten 2 partial messages which were cut off. If you have left a message, and I have not returned your call, please call back, or e-mail me. I respond to all messages! The boys turned 1 week old on friday. They are fat and shiny. I swear that when I got home from work last Thursday, said "Wow! You guys have gotten BIGGER while I was gone!" And so it goes. I am eagerly awaiting the Opening of the Eyes, for that is the beginning of t.r.o.u.b.l.e. Fun kind of trouble. Laughnig over it kind of trouble. Oh boys, here we go. It was a beautiful sunny day, so the pack went outside for the first time. Lots of napping going on. Calm before the storm. Vala thought they should play in the dirt and grass, despite my laying down of the flannel sheet. They did not seem to mind. It did not disturb their repose. 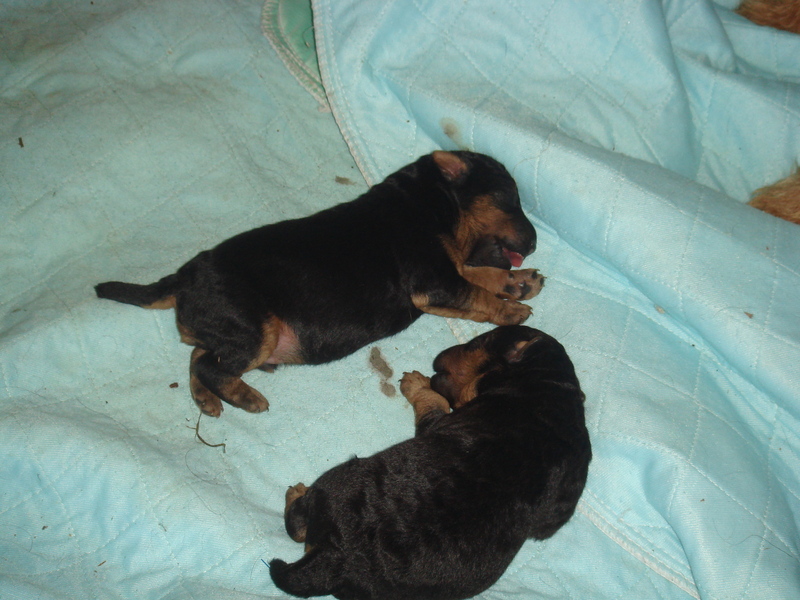 Vala presented us with pups yesterday. All went well, and they are bright and shiny little fellers. Fellers? As in boy dogs? Yes, all male. 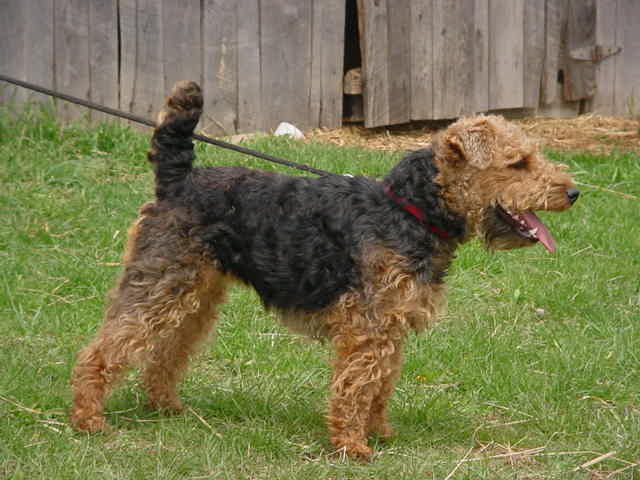 And if they are like their sire, or grandsire, they'll be fantastic dogs! 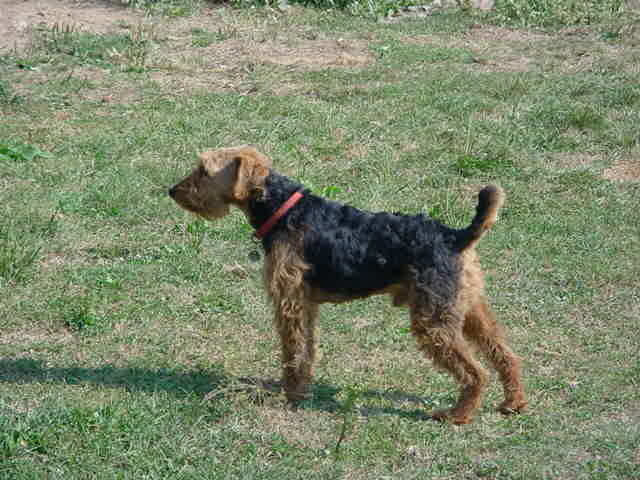 If you are interested in seeing Gladwyn's sire, Ch Purston As Good As It Gets, click on Happy Tails below to go to his home kennel website in Romania. On the left of the page, when you hover your mouse over "Gents" a menu will appear, and you can click the Goody button to see Glad's sire. 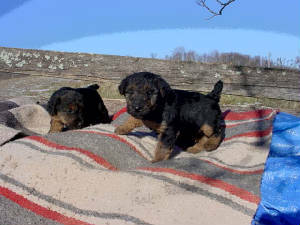 You can also see his half-brother Alex, by clicking the link that says "Alex-Junior World Winner in Dortmond"
Glad says he wants to be a show dog, because he has so many brothers and sisters that have earned Championships and Junior Championships! We'll see. Unfortunately, Fanny turned up not pregnant. We'll try again in fall. 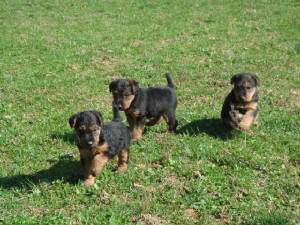 Please send an e-mail if you are interested in discussing possible purchase of one of these great little boys. 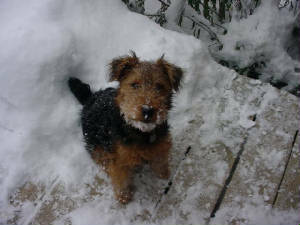 Here's little Gryphon's Rocket Radar, waiting patiently for his flight to Washington last winter. 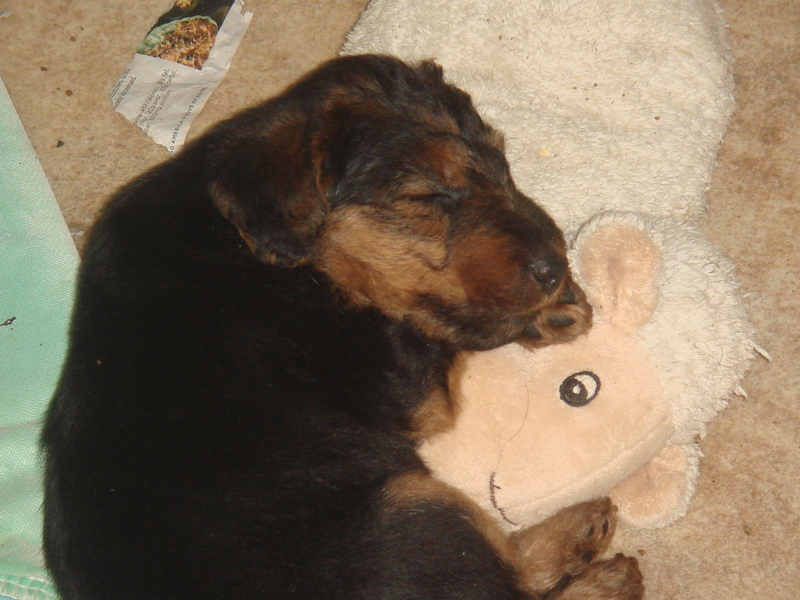 He was 9 weeks old, with the wisdom and patience of a Saint. Rocky boy is all grown up now. He writes his mama Fanny, on a regular basis, with news of what he is doing. He's a good boy, and writes regularly. Gess what? We gotz bunnirabbetz here. 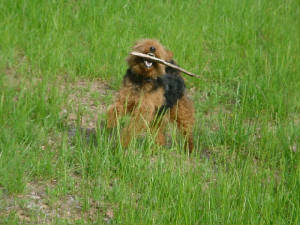 Mossatime the be outta da fence, but Sonar sez he cached one be4. The peeksure inna box proves you ken catchum. Rocky don spel 2 gud, but that's ok. Fanny doesn't read all that well. He often has his people include an attached picture of himself which he calls putting "peeksure inna box". He's so vain, he probably thinks this site is about him! Myfanawy and Vala were bred in late February and early March. 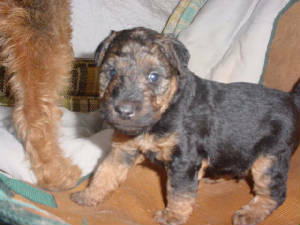 If all goes well, that should produce a passell of pups ready to meet their new people in late June. Gladwyn is the sire. 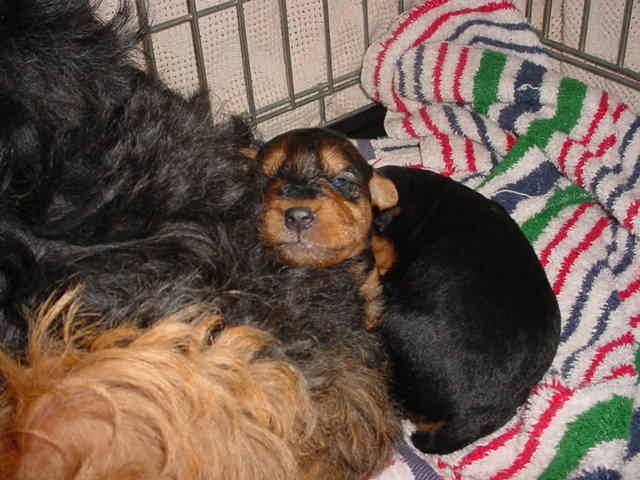 Please scroll down for some pictures of Fan, Val and Glad, previous litters too. 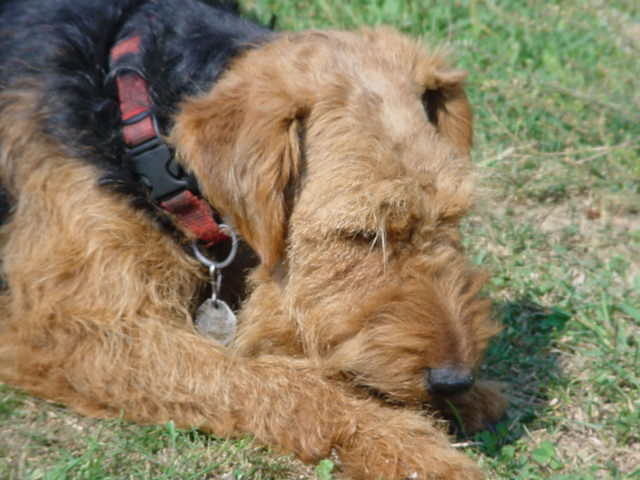 Gladwyn, the Happy Friend, is growing into a good looking dog. 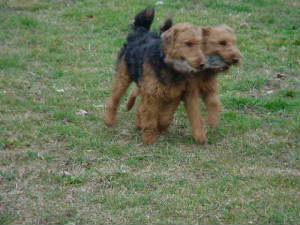 He and his friend Vala are quite the playpals, and have a couple of great tricks. My favorite is the "double fetch". Fanny whelped on July 7th. 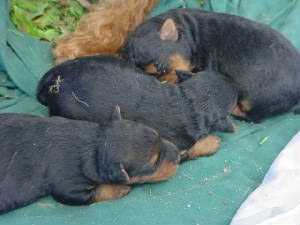 The litter consists of 3 males and one female. They have all been sold. Congratulations to the new families. Pups are going to Washington, Ohio, New York and Mass. 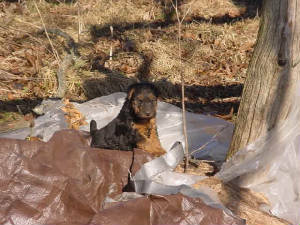 Another litter is planned for next Spring. As fast as summer has gone by, it will seem like no time at all. 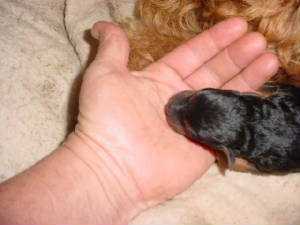 Deposits are always accepted on future litters. Seems like there are just not enough of these little darlin's to go around! 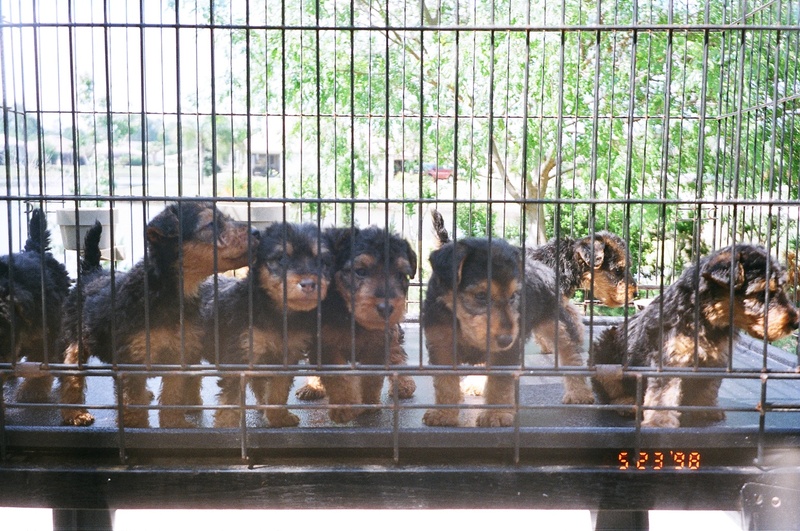 The females are priced at $950, males at $850, with limited registration. Regular registration is also available. Fanny will be bred this Spring, as will her daughter Vala. 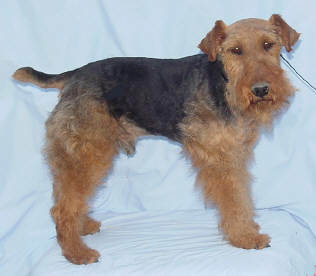 Gladwyn will be the sire. 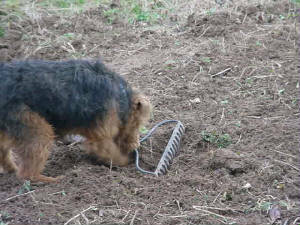 It's been a warm winter so far, so I've been doing a little winter gardening, preparing for spring planting. Vala is a big help. 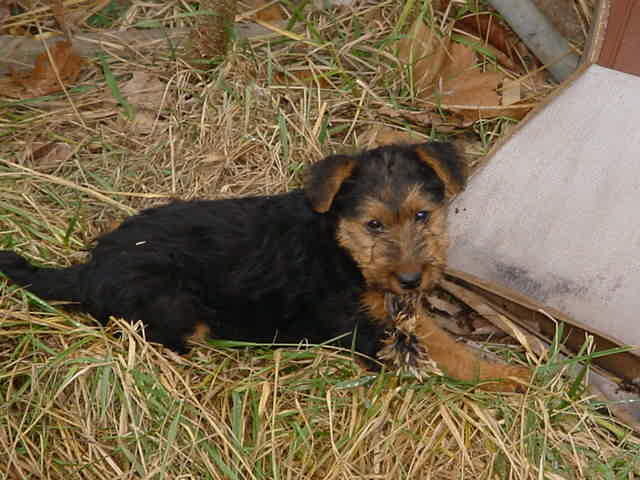 Click here to inquire about purchase of a pup. 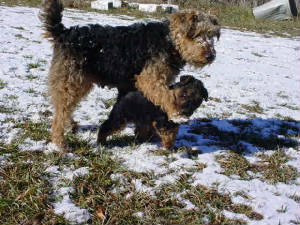 Here is "Smitty" sire of Fanny's '06 litter, with Vala offering her bone. She is such a generous pup! Gladwyn, Welsh for "Happy Friend"
Gladwyn arrived a couple of weeks ago. His sire is a Champion, and his dam a Jr. Champion. 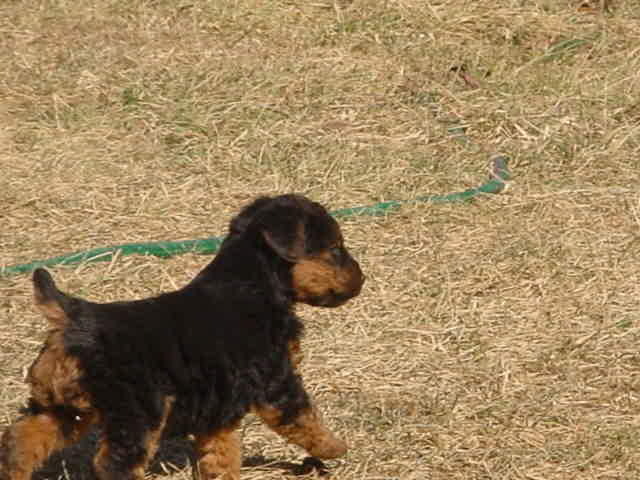 Both are Romanian bred. Check back in for links to their home site. Please send me an e-mail if you would like to be contacted as information on the litter is available. A boy and a dog. Default title to the picture is "someonetorunwith". It's something we all need, and through my life, running with dogs has added to my life so markedly that it fills me with joy to see scenes such as I have in the last three days. Here's Leo, who was denied a bottle of water today, as it belonged to Andy. I believe the quote was "I found out this morning that I had decended a rung in the pecking order". The kindness and love with which he spoke those words earns him Kissing Rock's "Dogman" award for 2005. Kissing Rock Myfanawy, Fanny, is a delightful little dog, and has proven herself to be a great momma. She is protective, but not overly so. 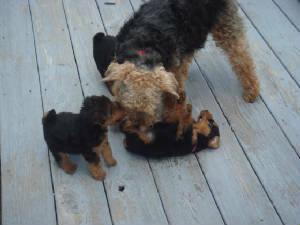 Lets the pups play with their Grammiedog Grace. She did not mind when I loaded them up and took them outside for the first time. The boys, though bold enough, were outshined by Sister Val. They did get cute up there, but about the same time my battery ran out, Val took a tumble down behind the woodpile. End of photo session. 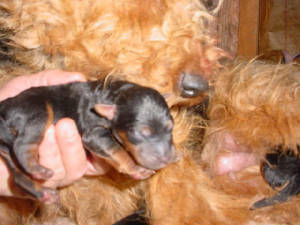 Fanny, about half way through carrying these amazing pups. 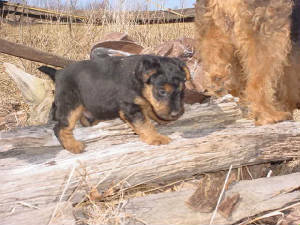 Scottie was the sire of the litter above. He is now retired from stud. These dogs can be quite the little clowns! 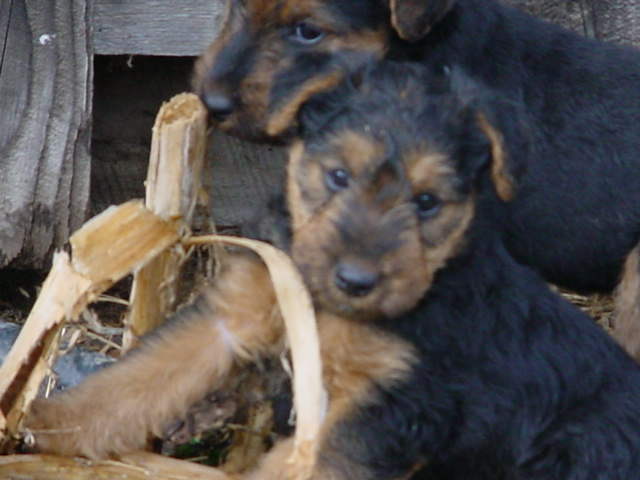 Fanny and Scottie are AKC registered, and pups can be registered. "Hey, Lady! You got a release for my picture?" Buddah, sit! Well trained already. "Can I be on the calendar? Please?" A couple of Mr. Red Face, waking up, and wanting Up.